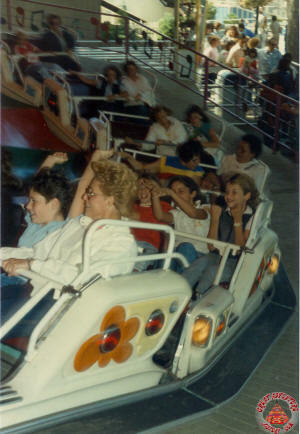 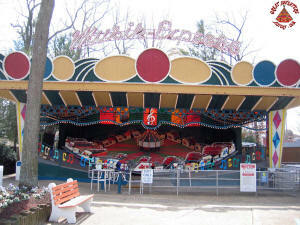 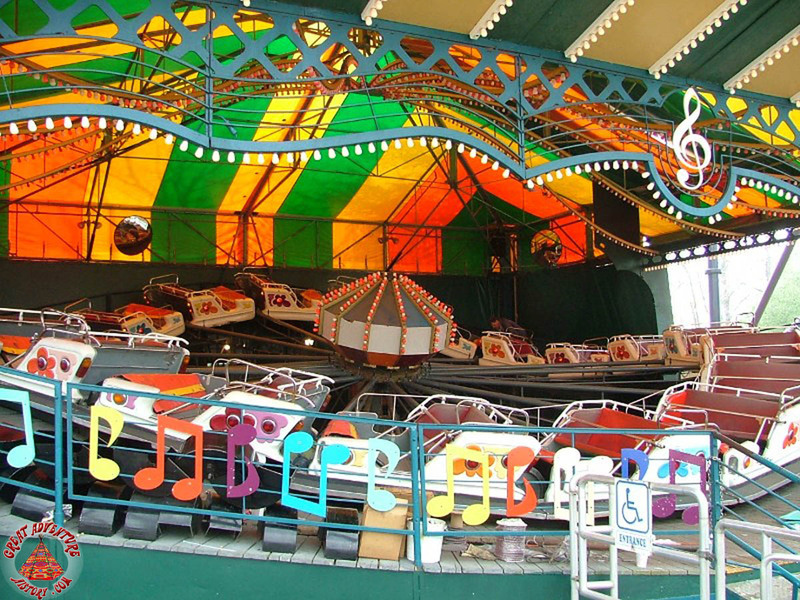 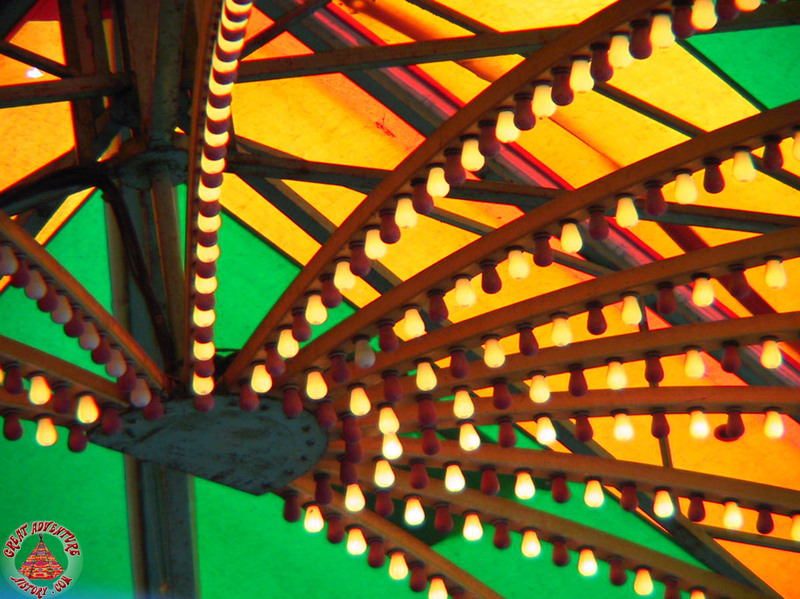 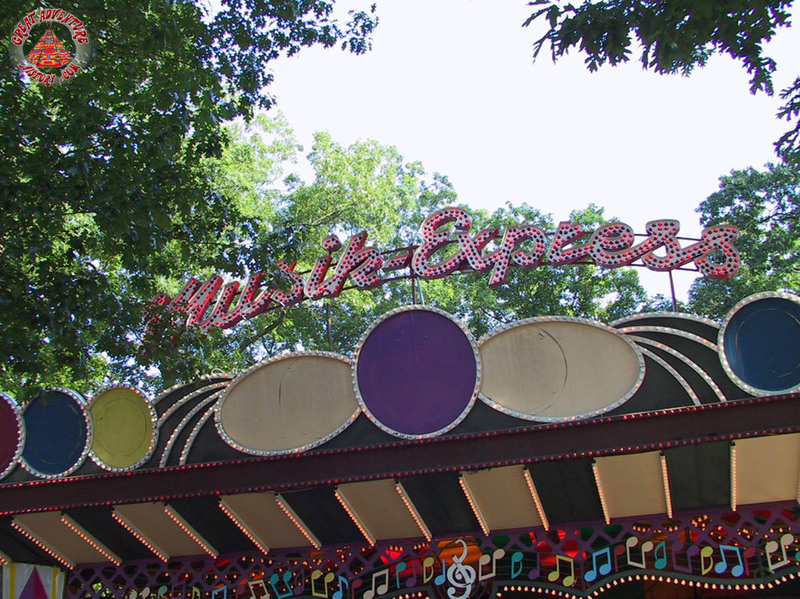 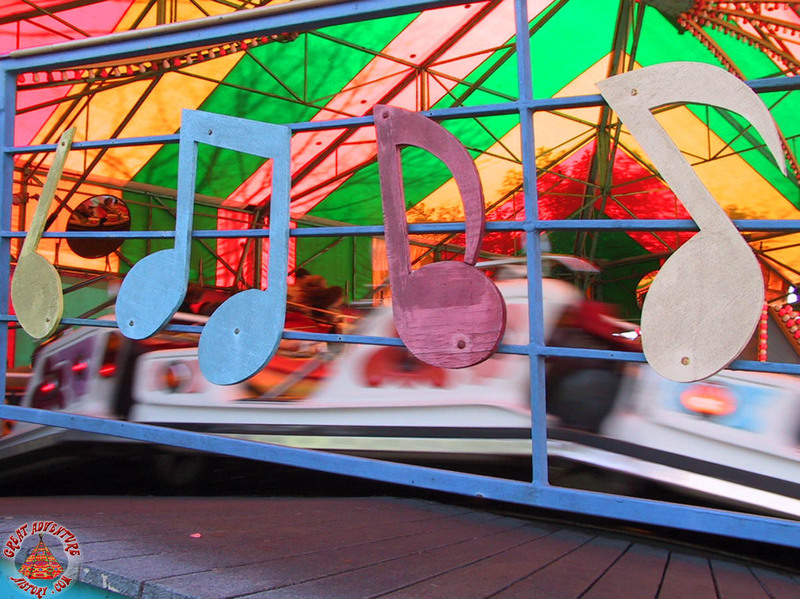 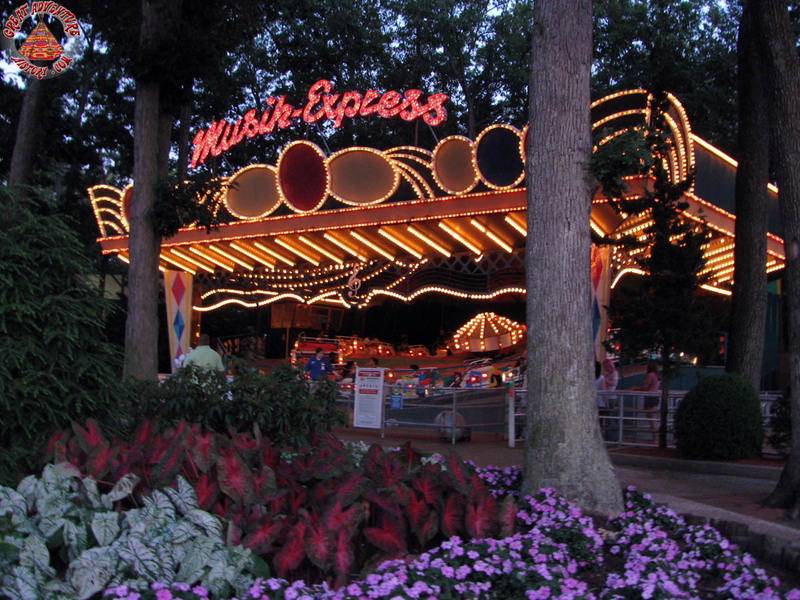 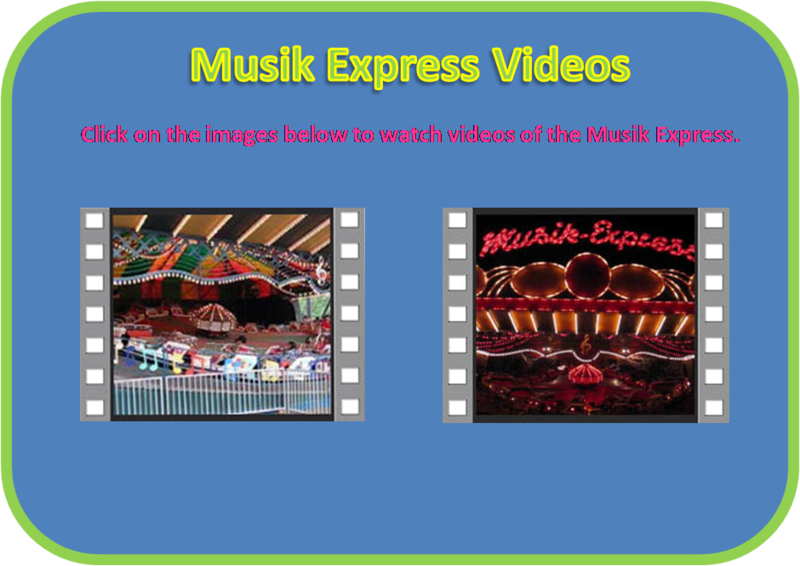 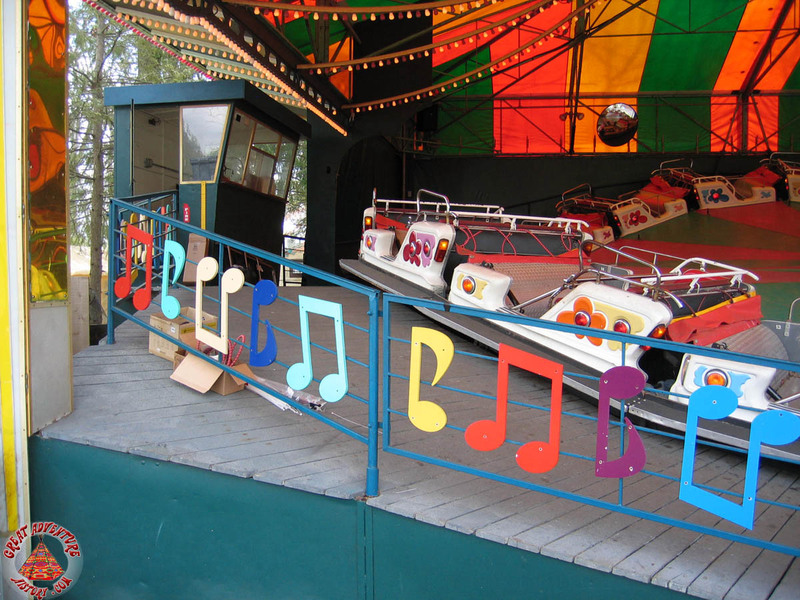 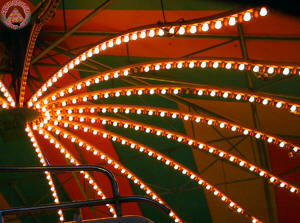 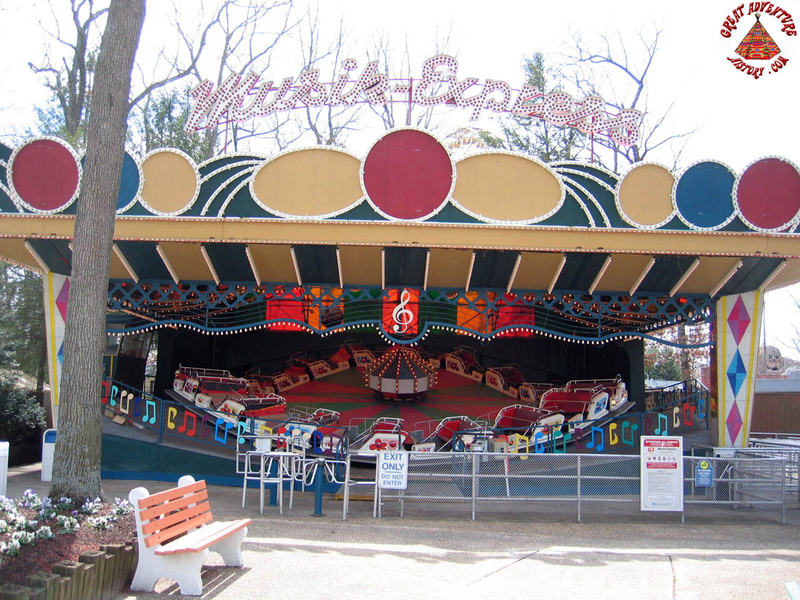 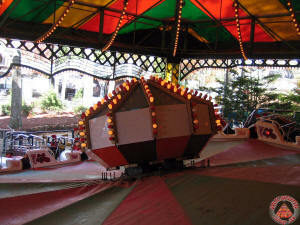 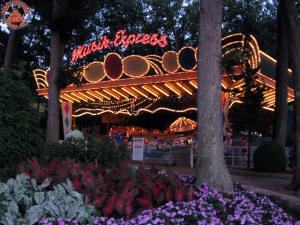 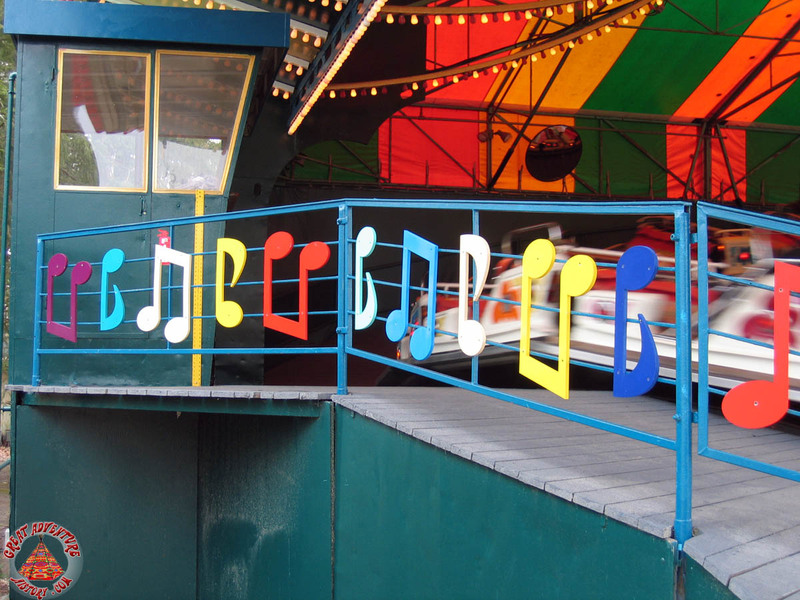 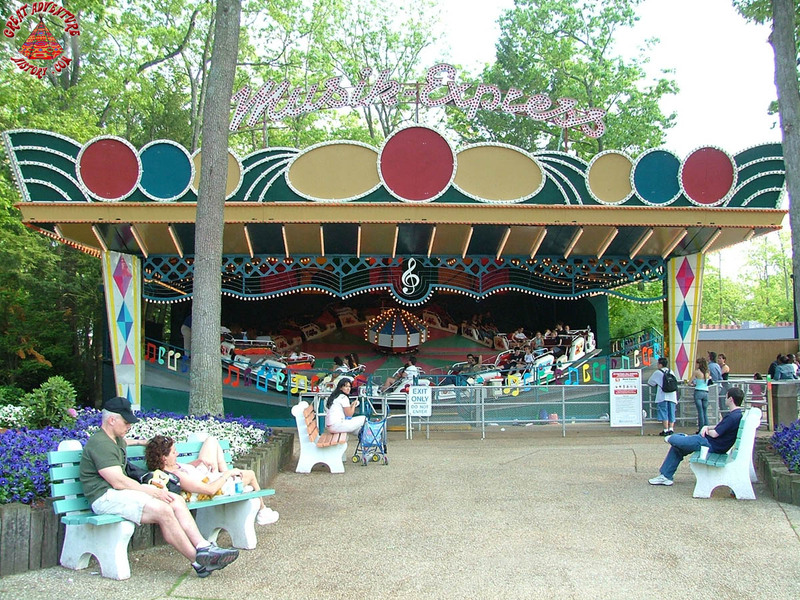 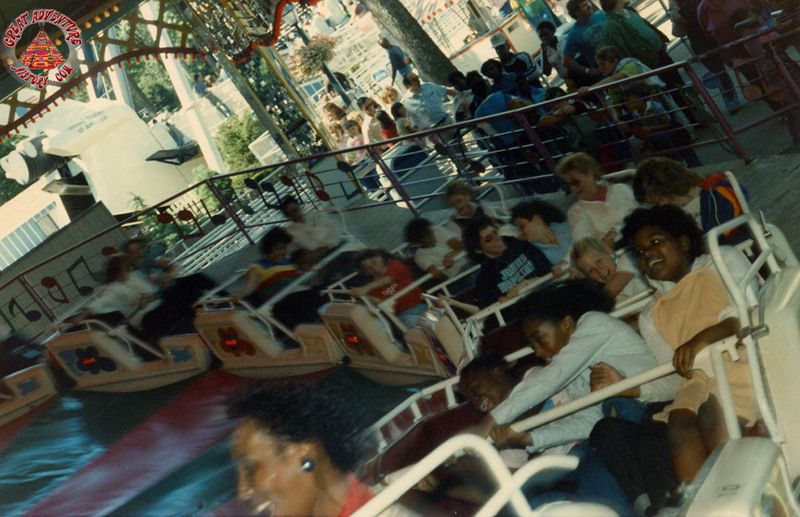 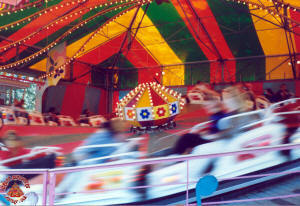 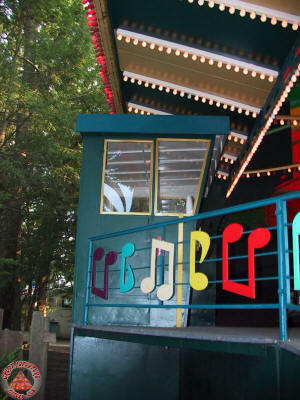 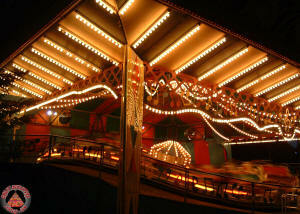 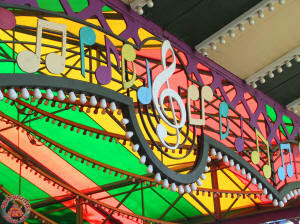 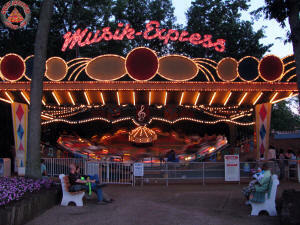 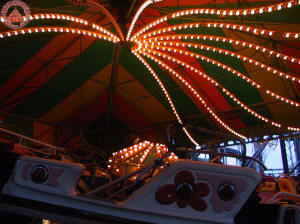 A mainstay found at many carnivals, boardwalks and amusement parks is the Musik Express ride. 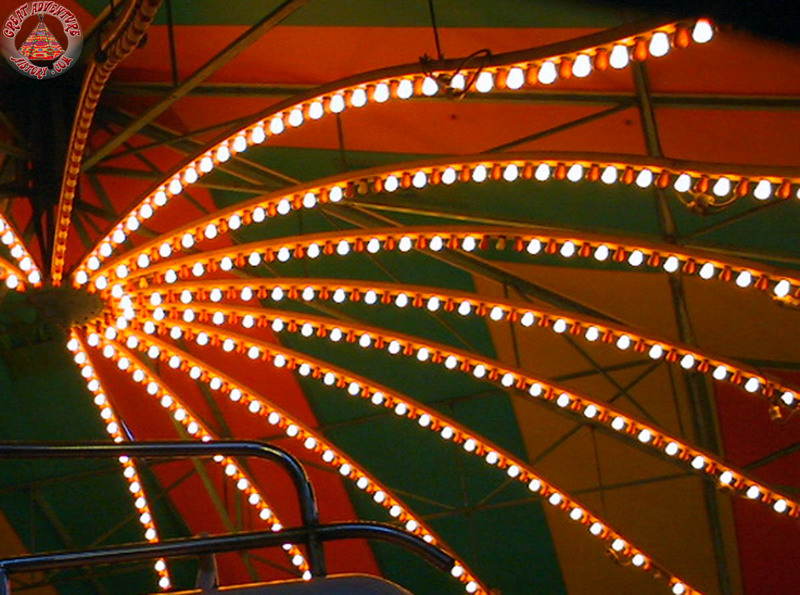 These rides combine the thrills of high speeds over an undulating, circular track with the sensory effects of bright lights and music. 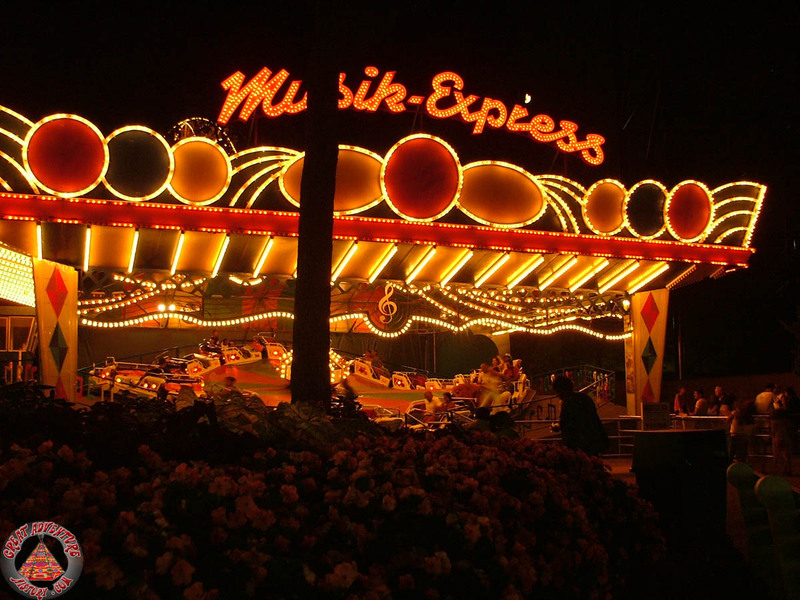 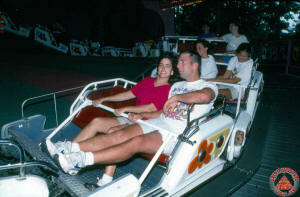 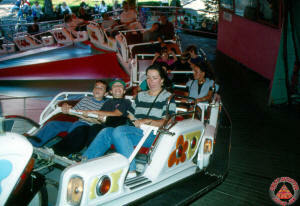 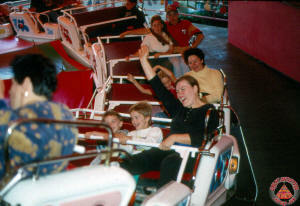 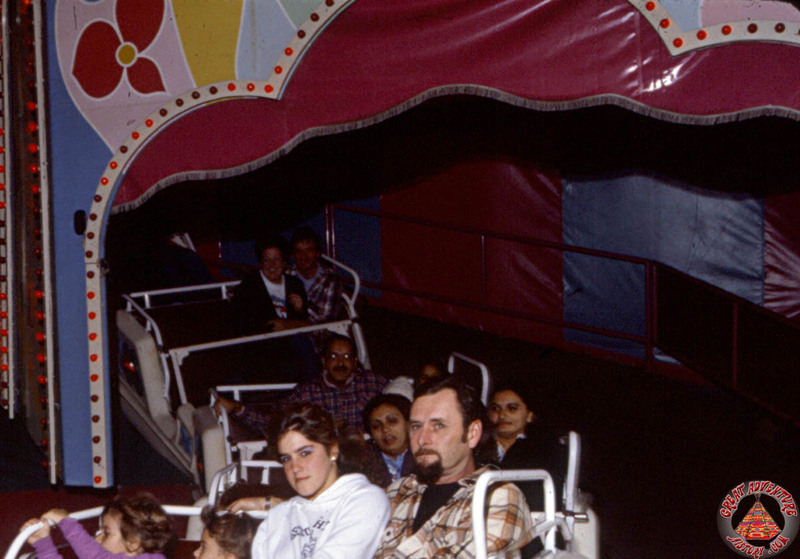 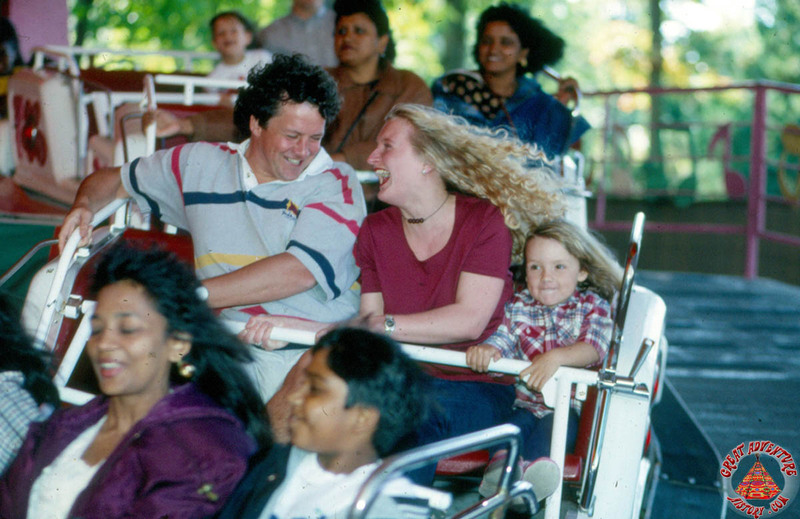 The Musik Express is a favorite among all ages since parents and children can ride together, and also a favorite of couples as the forces of the ride press riders together in their seats. 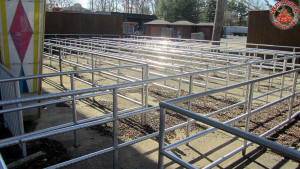 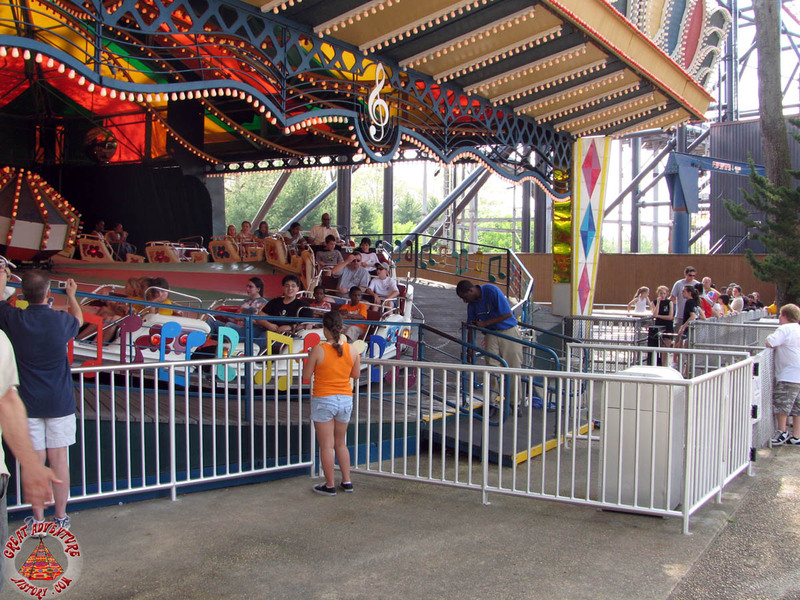 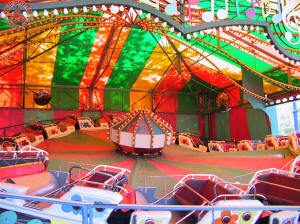 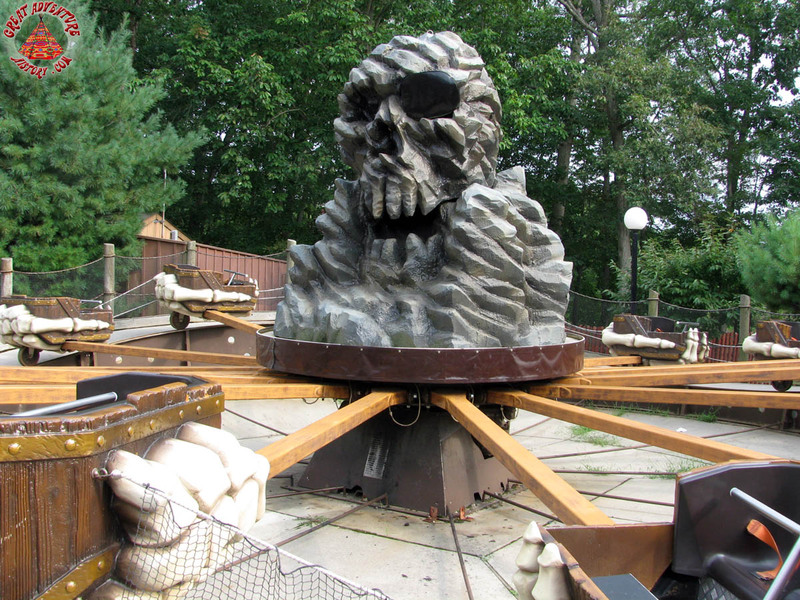 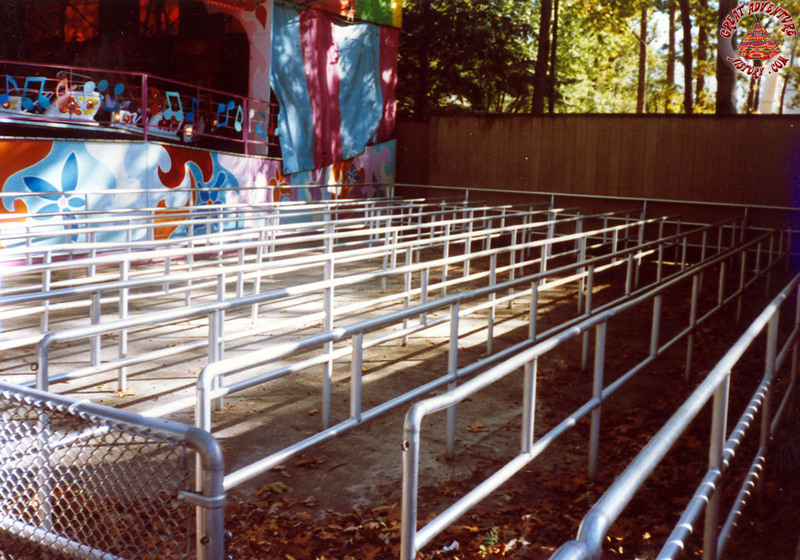 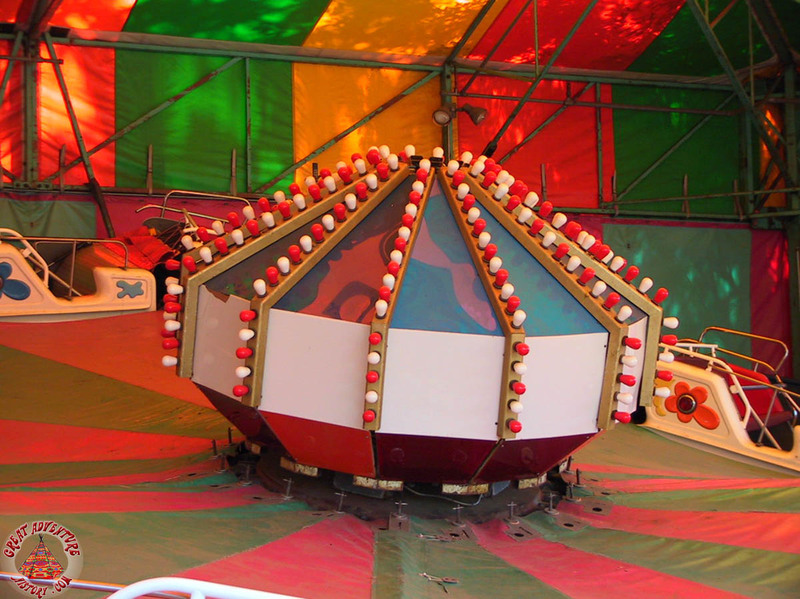 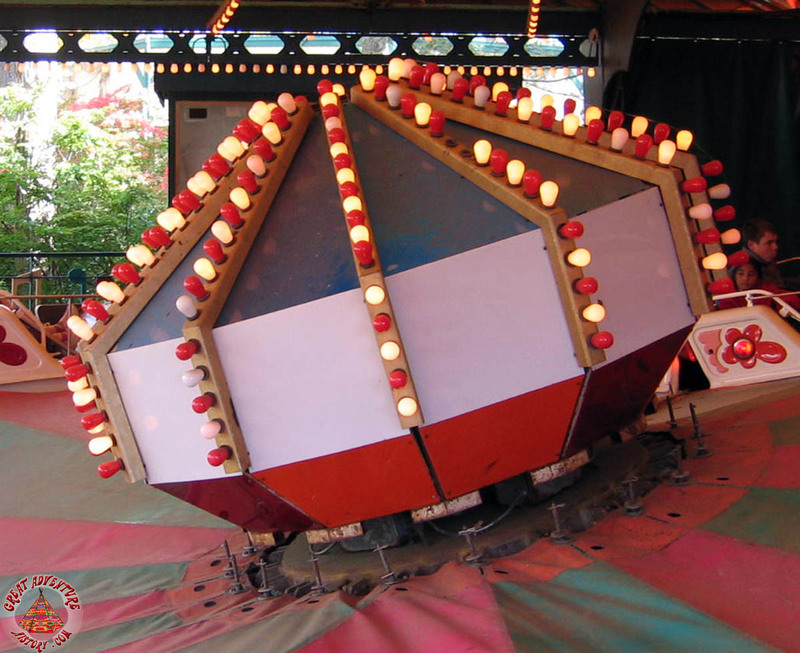 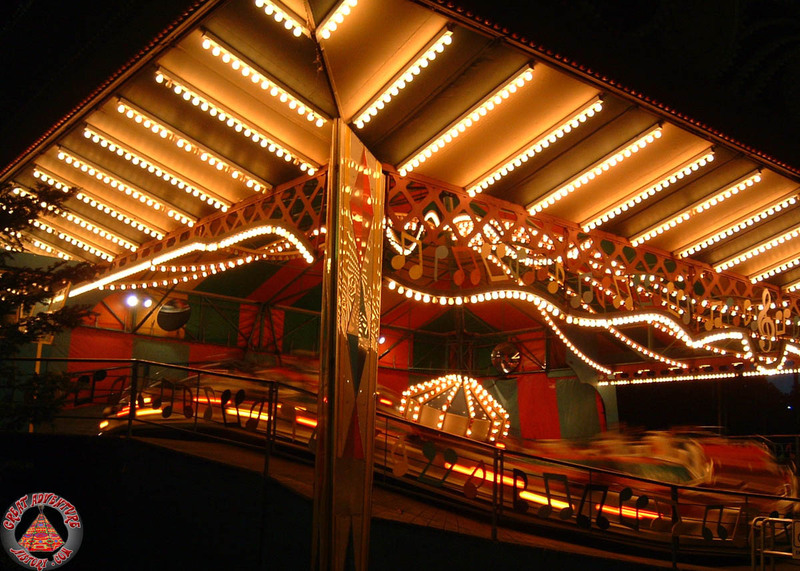 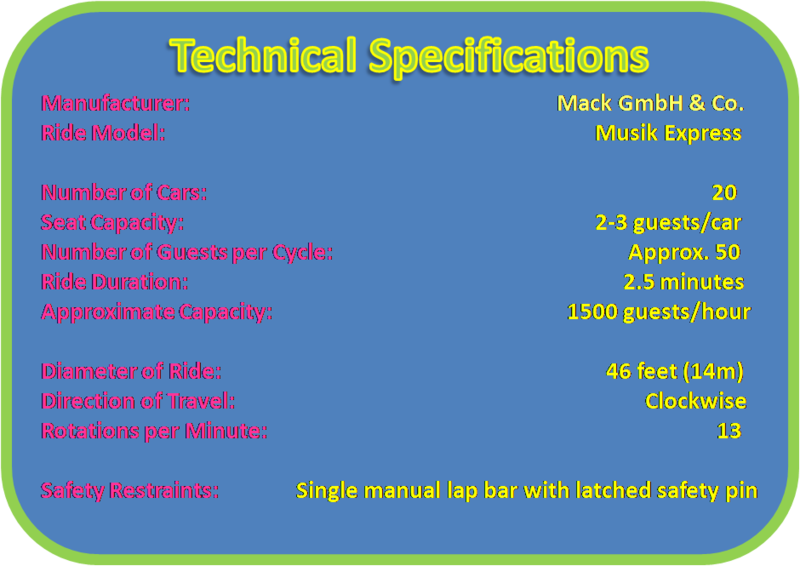 This ride model has been manufactured by many different companies, with owners replacing original rides with newer upgraded versions over time. 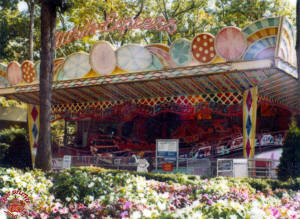 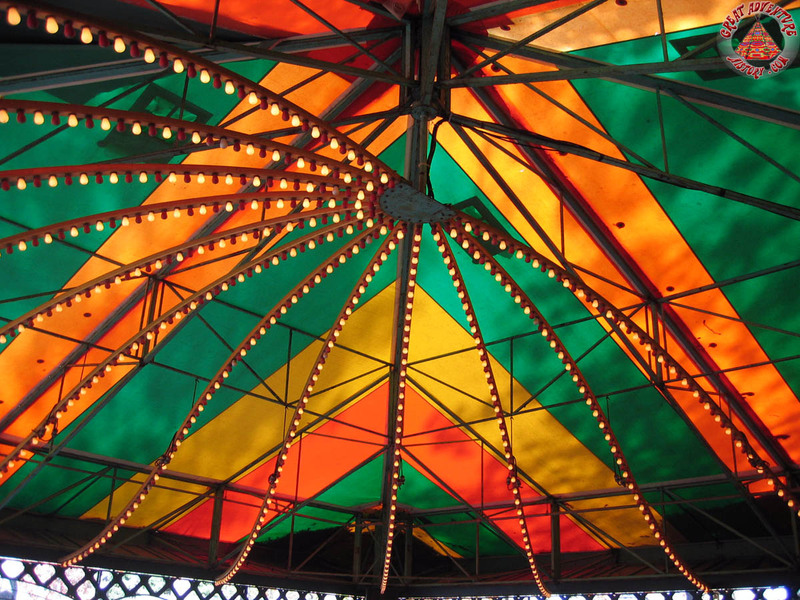 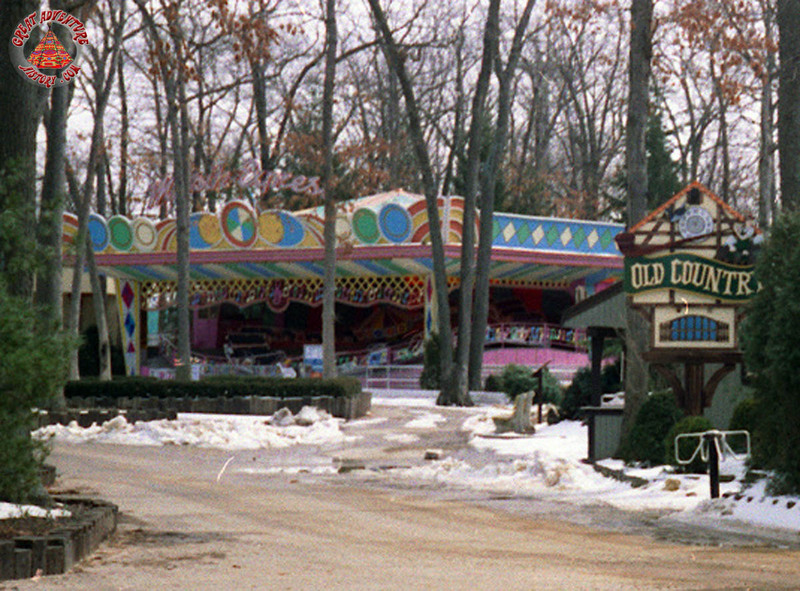 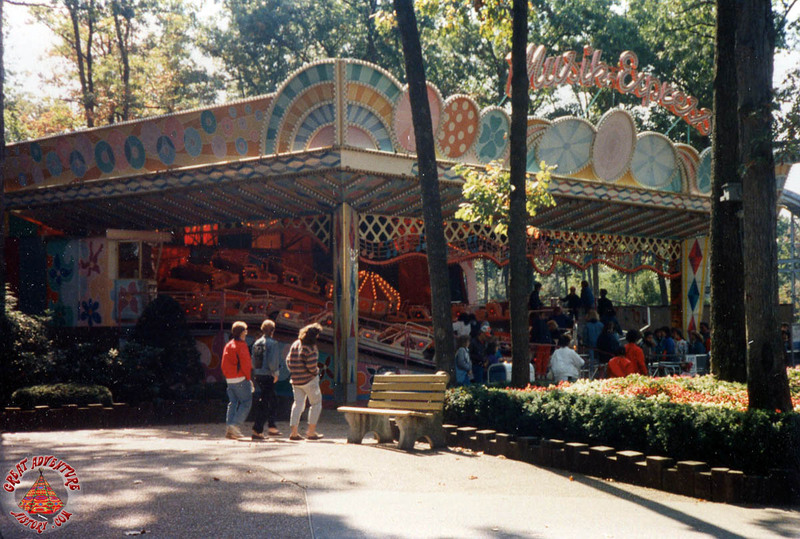 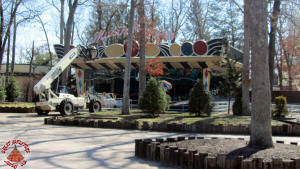 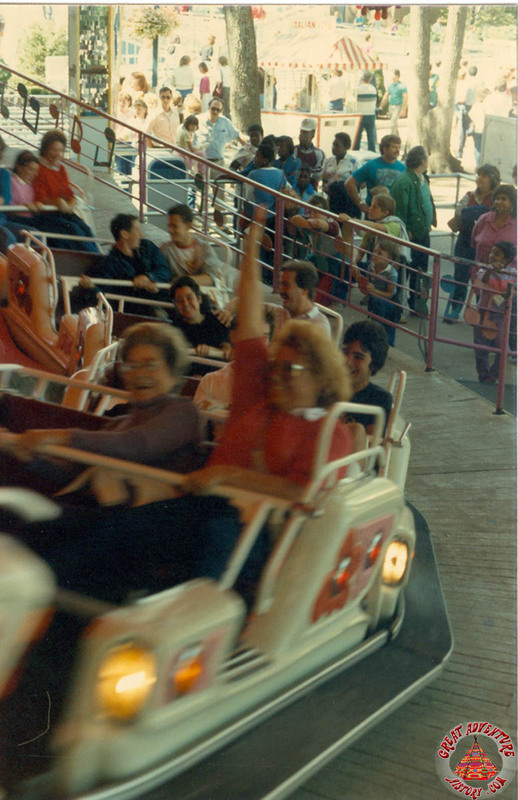 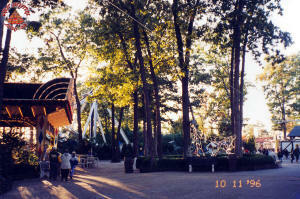 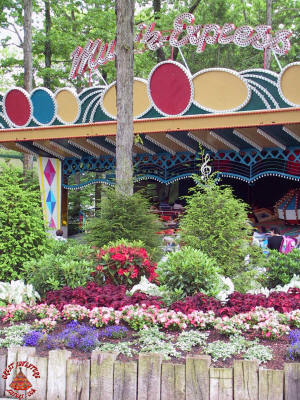 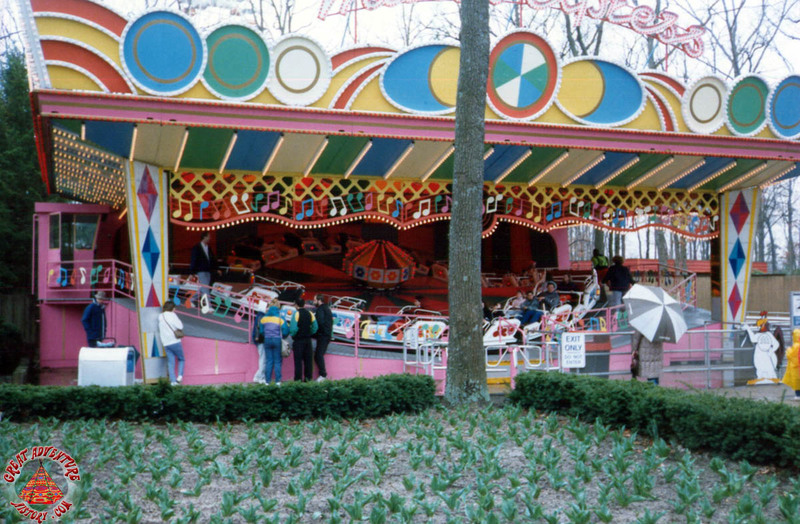 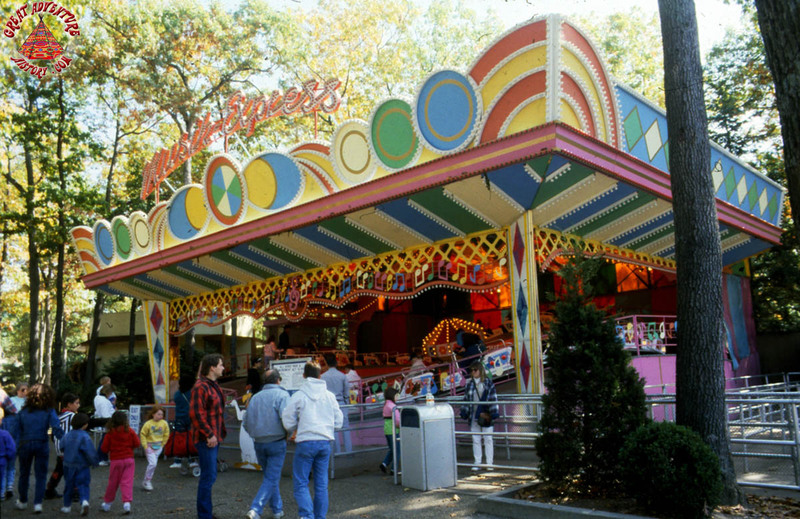 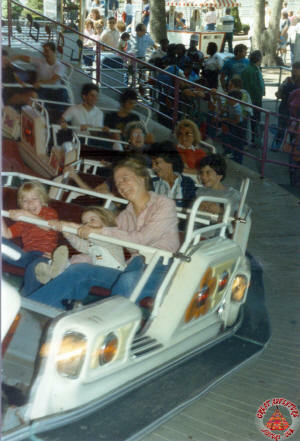 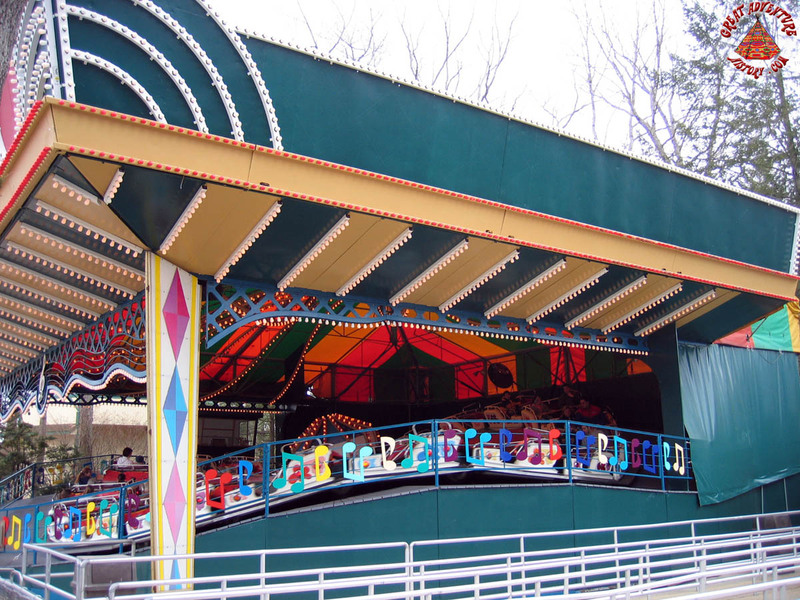 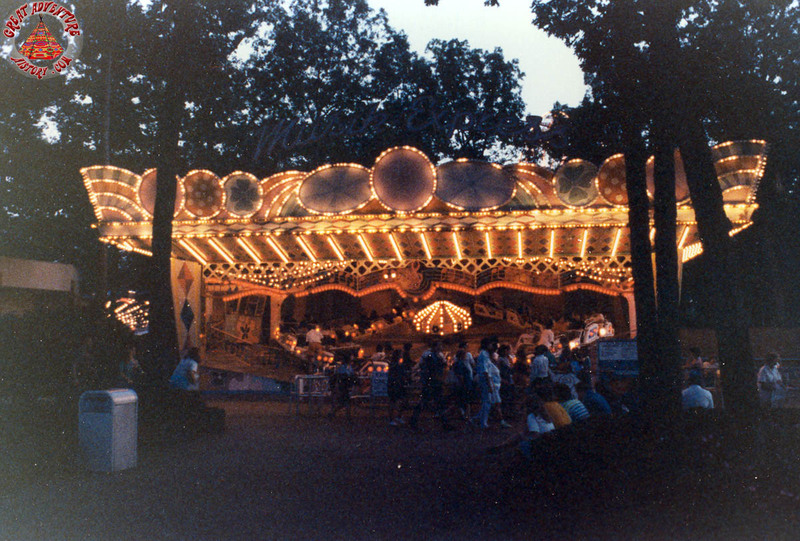 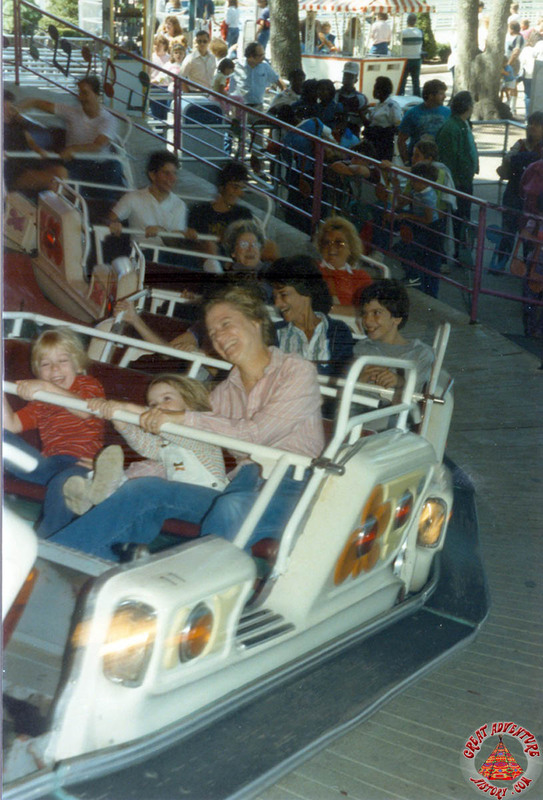 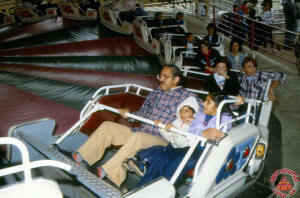 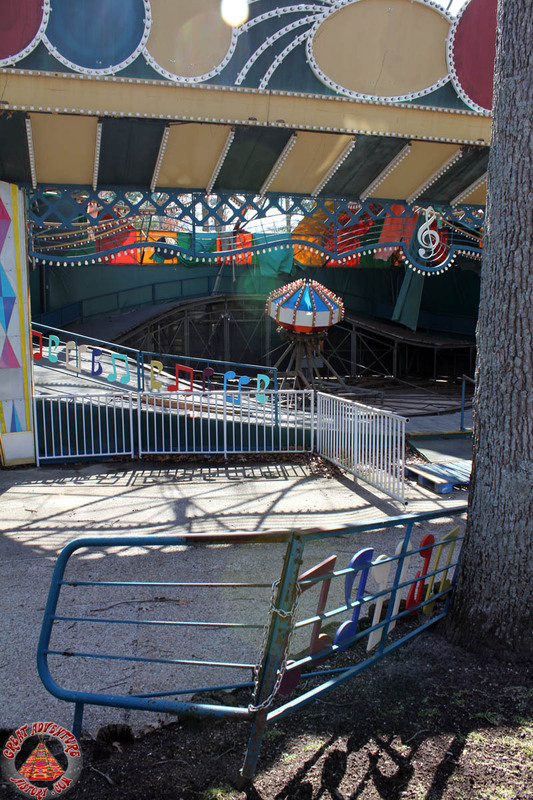 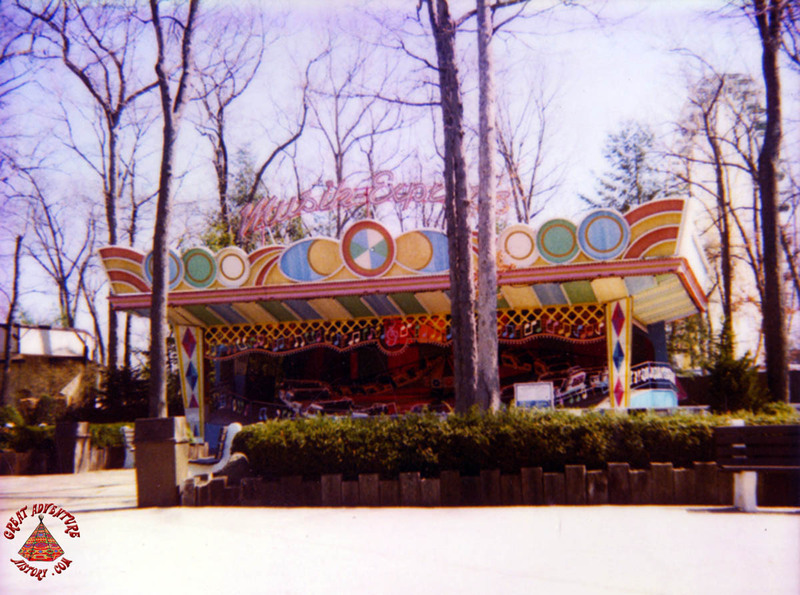 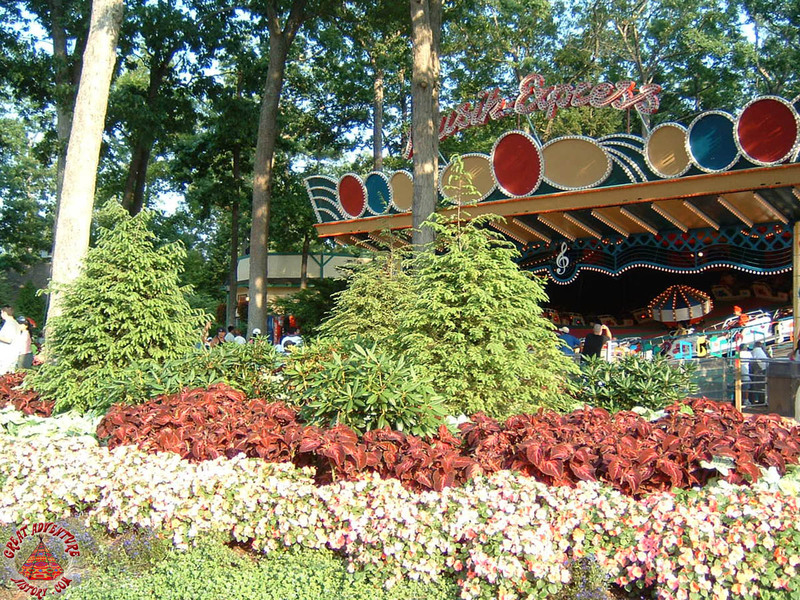 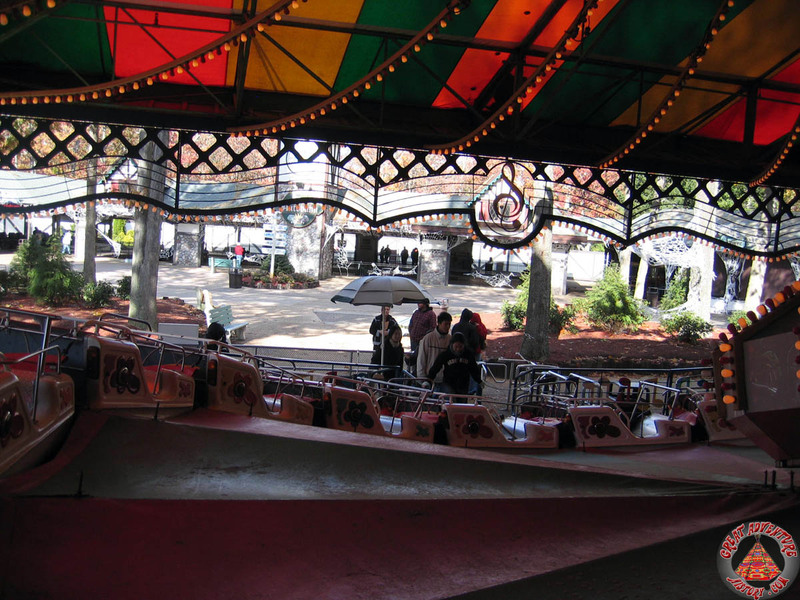 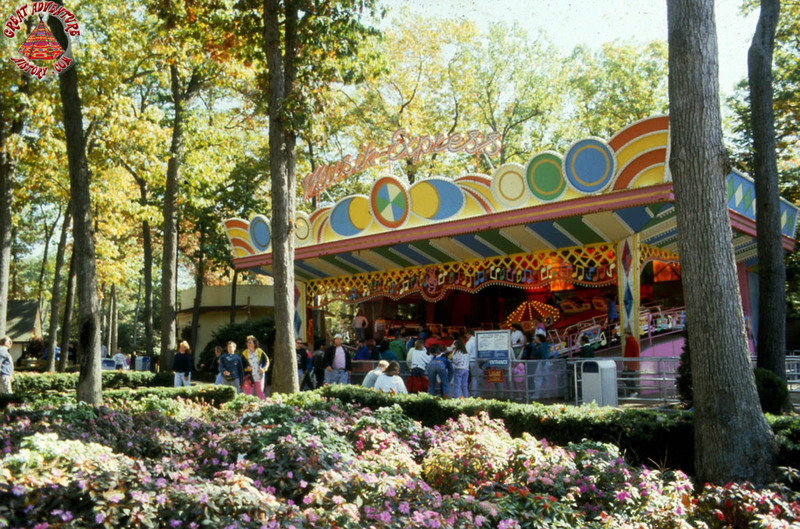 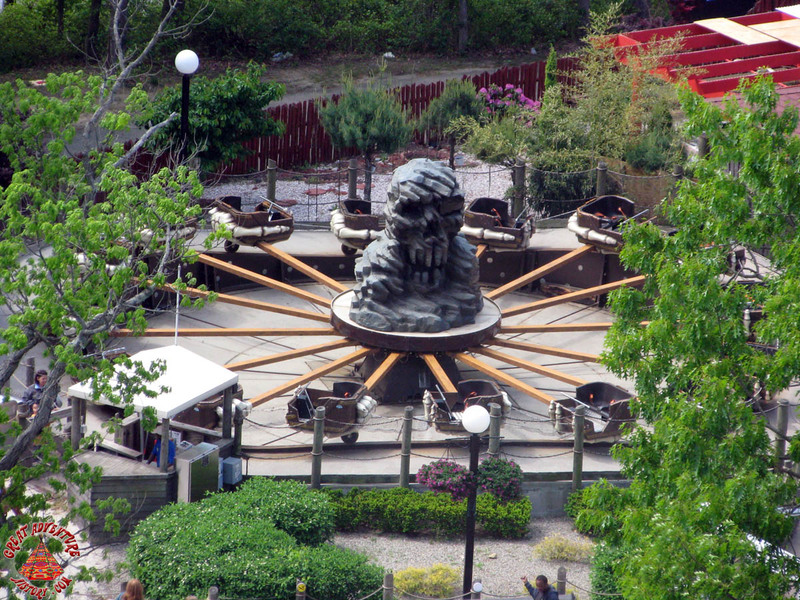 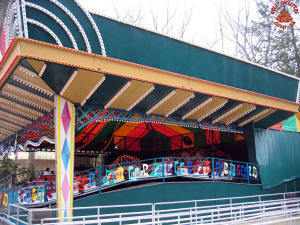 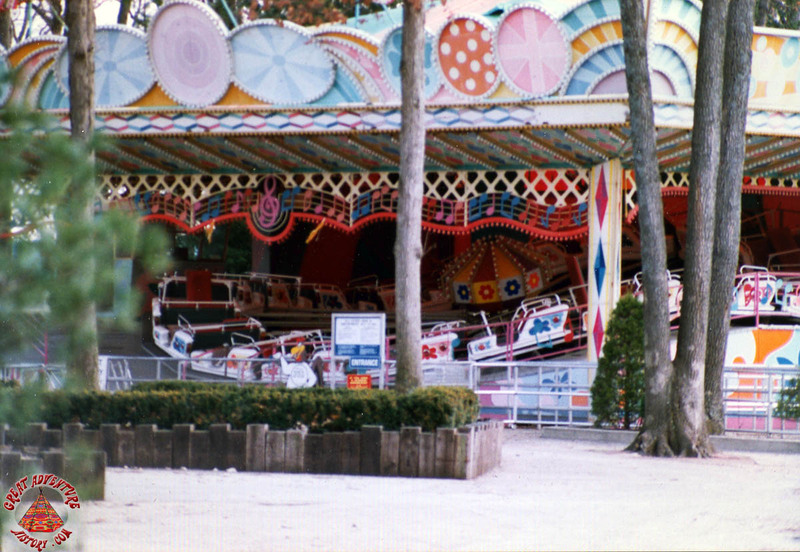 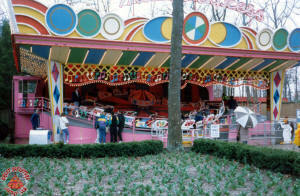 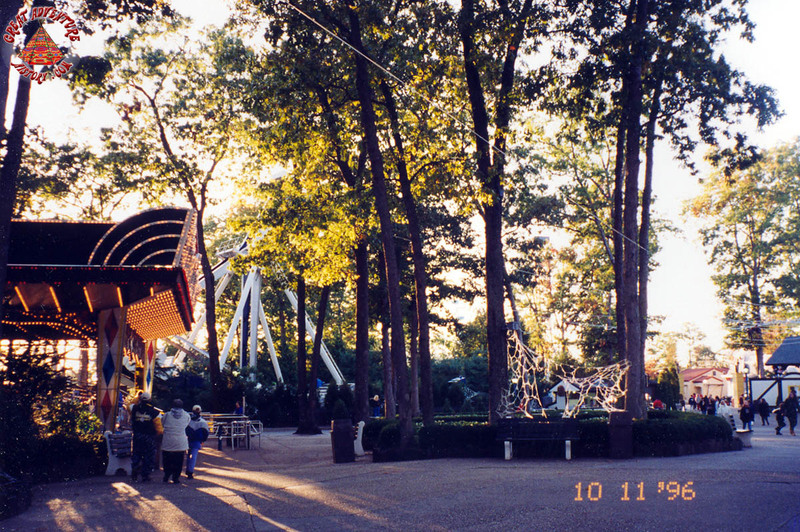 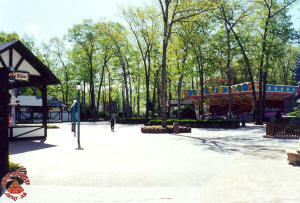 In 1976, Great Adventure initiated a park-wide expansion which included the relocation of the main entrance plaza into the area previous occupied by the Antique Cars ride and Happy Feeling Petting Zoo. 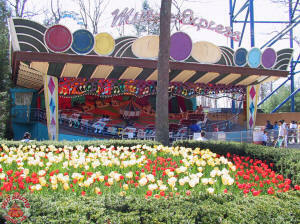 A parcel of that land was redeveloped to include two of the rides which were new for 1976, a Musik Express and the Alpen Blitz coaster. 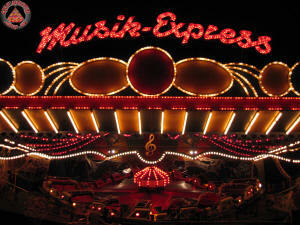 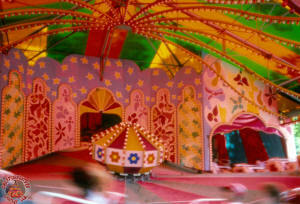 The Musik Express was designed by Mack Rides and came festoned with pastel colors and a vibrant lighting package. 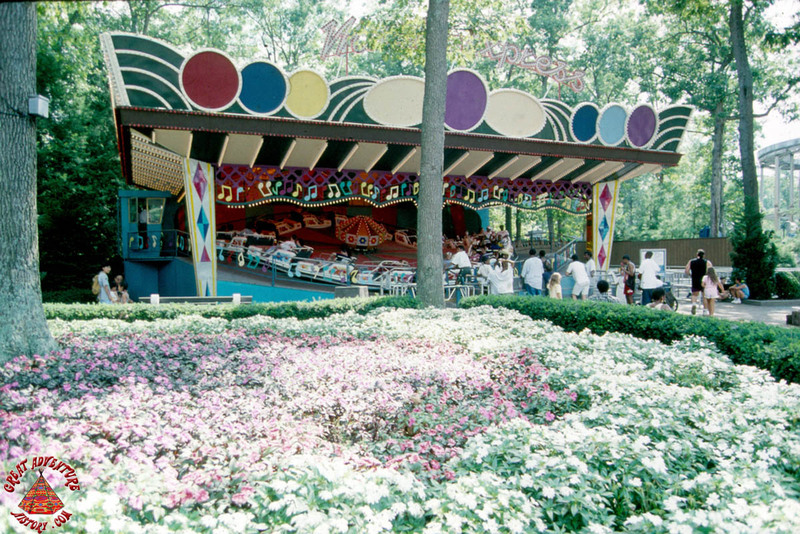 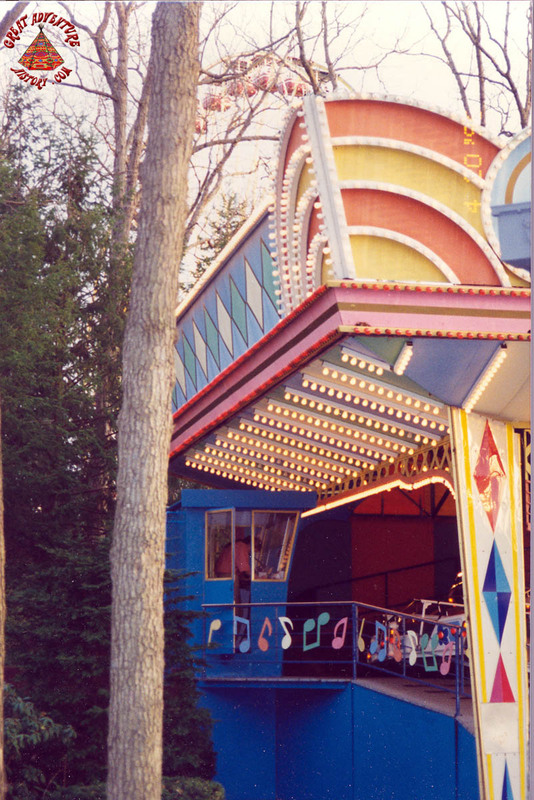 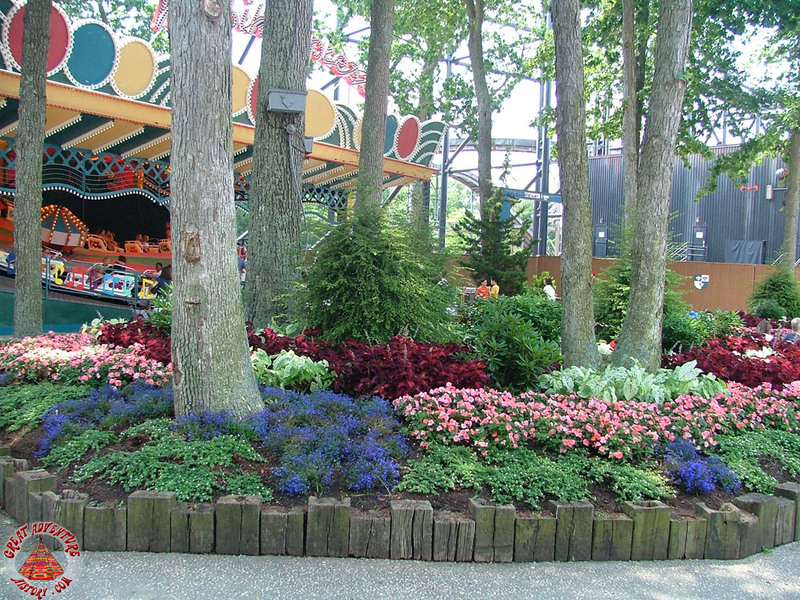 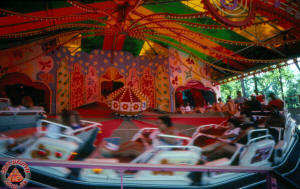 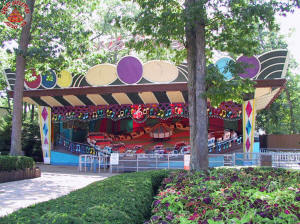 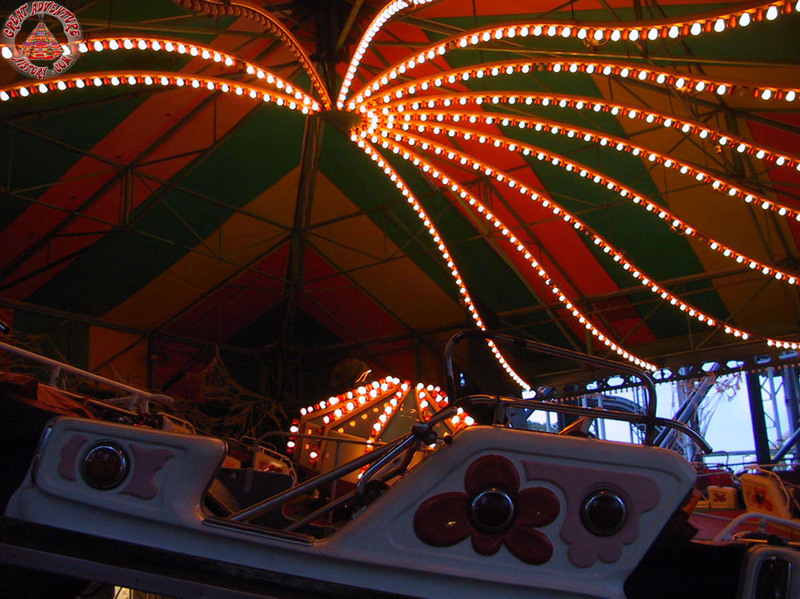 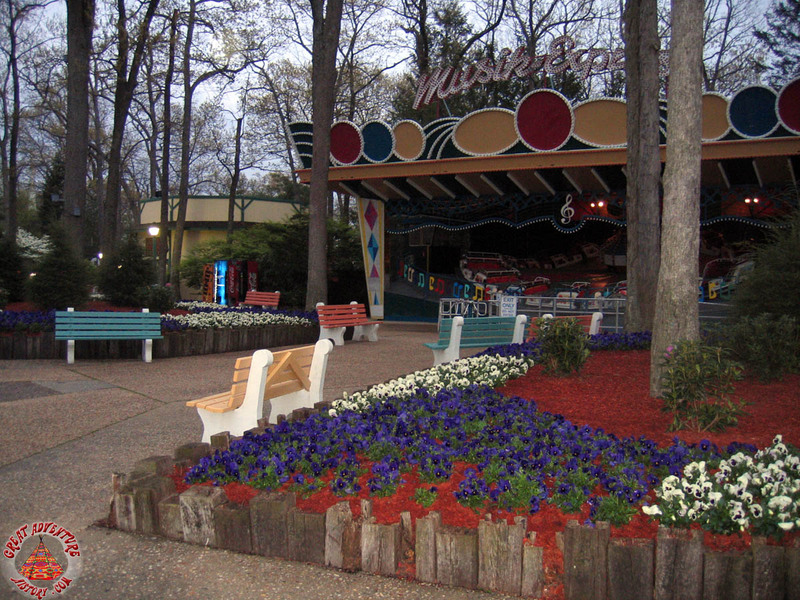 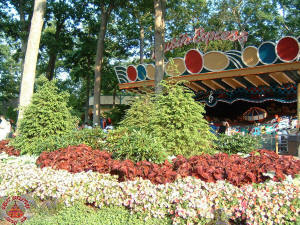 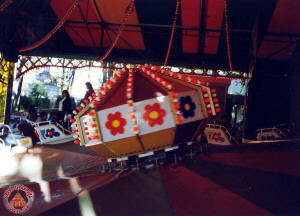 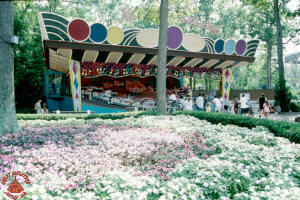 The floral hues of the cars and ride interior gave it a hippie-like 1960's atmosphere. 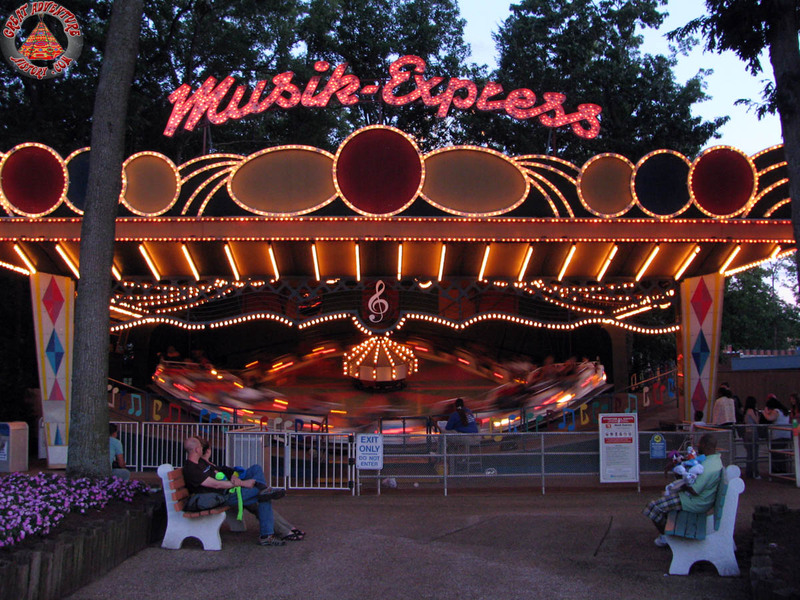 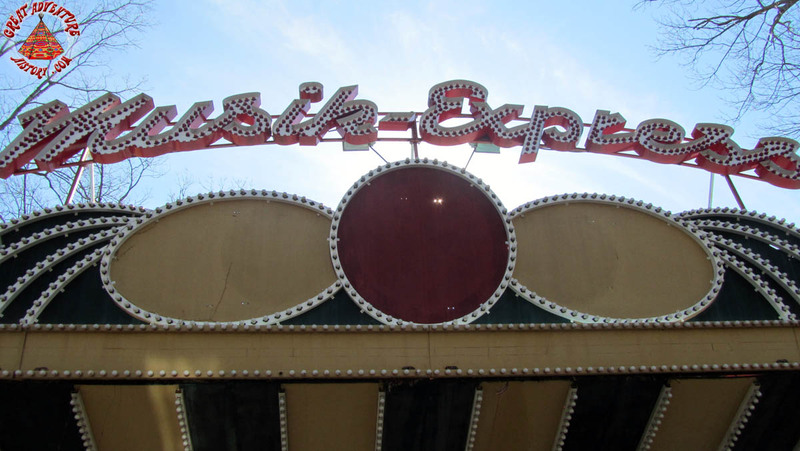 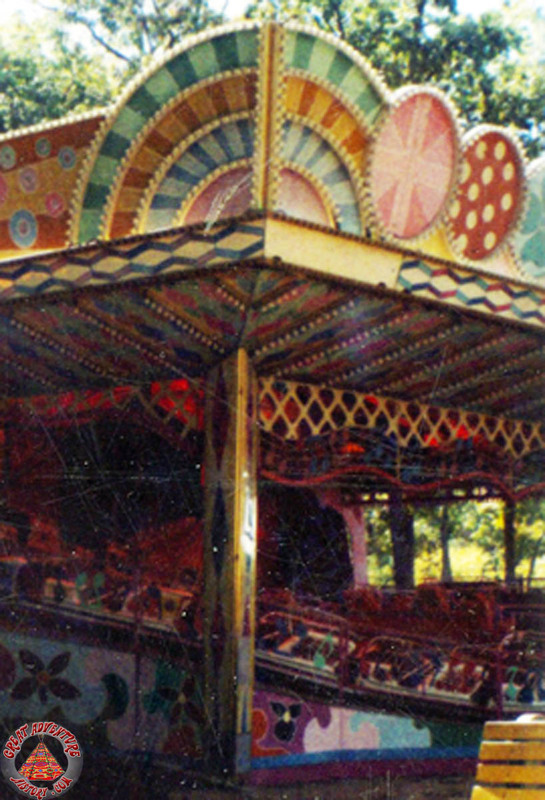 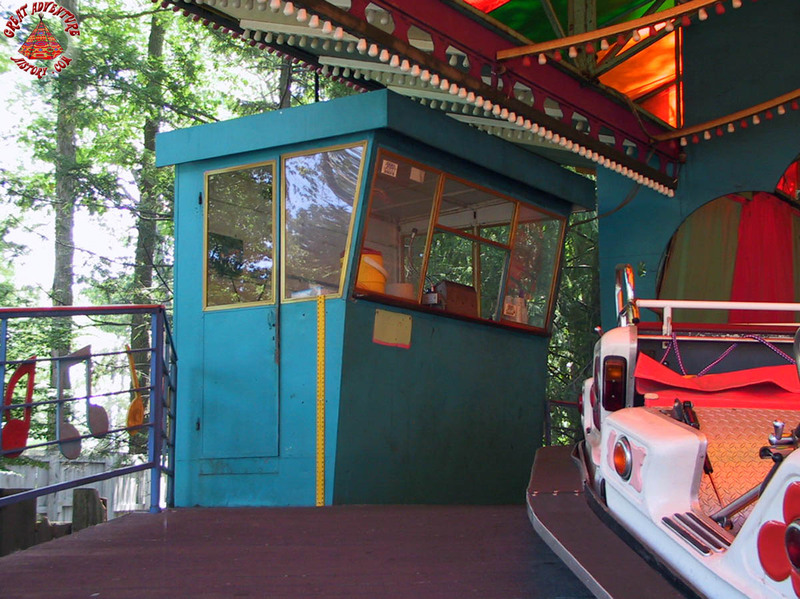 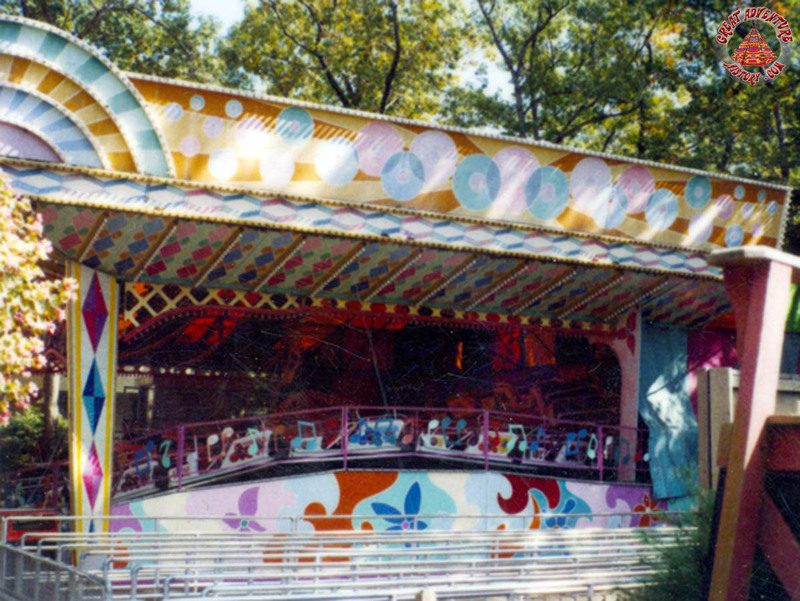 Supposedly, like the Sky Ride, this particular Musik Express design supposedly made its debut at the 1964/65 New York World's Fair though the research of GAH staff has not yet been able to confirm this. 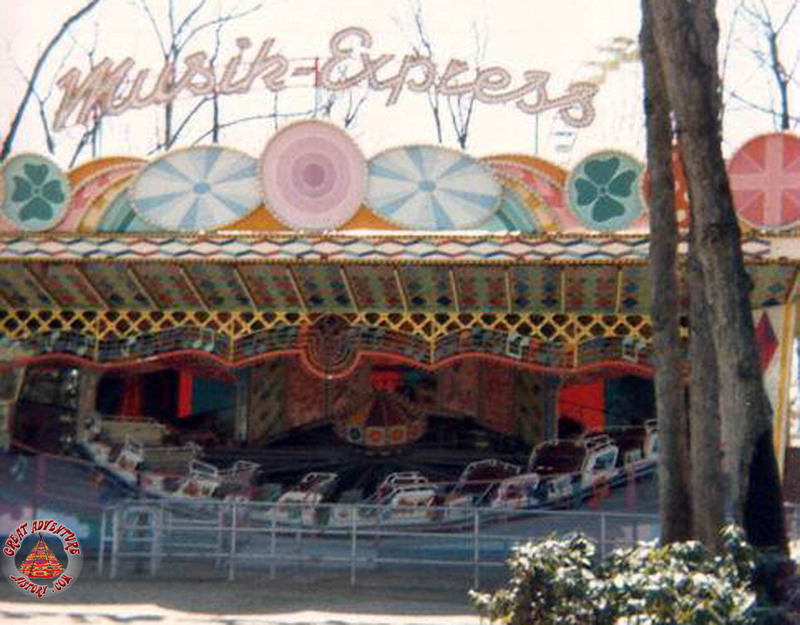 Aside from general maintenance, the Musik Express remained relatively unchanged. 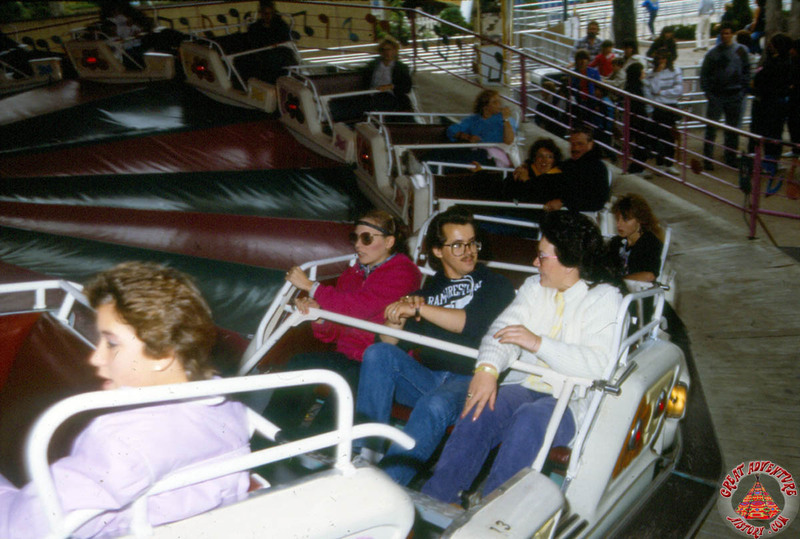 In the mid-80's, mesh netting was added between the cars to prevent any careless guests from accidentally tripping down into the open gaps between them. Also, for the 1988 season safety standards were increased significantly throughout the park by then-president Ray Williams. 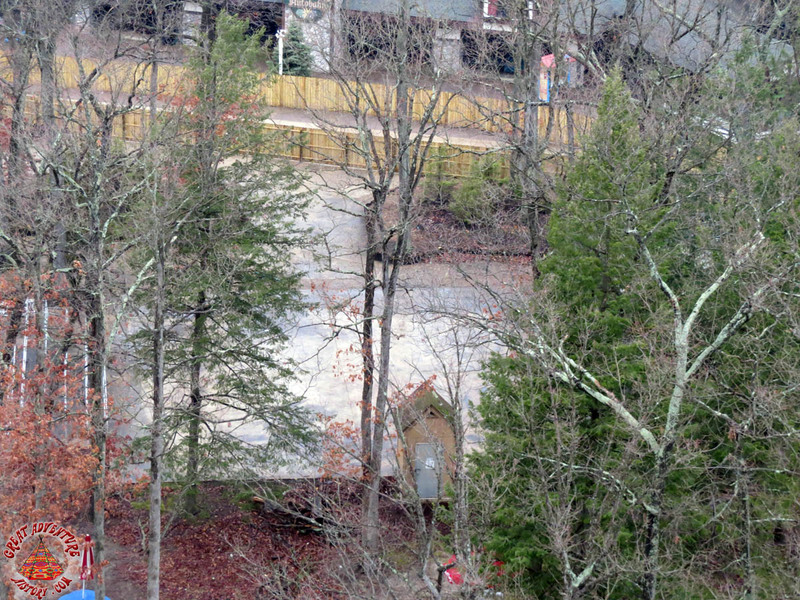 The wall concealing the back portion of track was removed to give operators a clear view of all cars at all times. 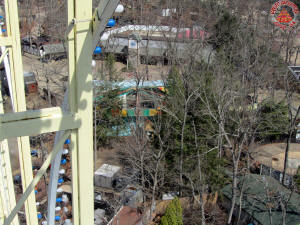 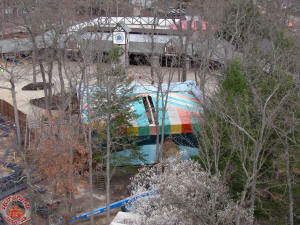 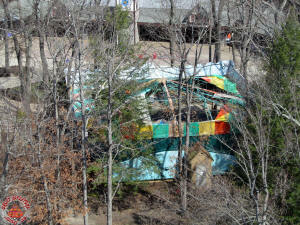 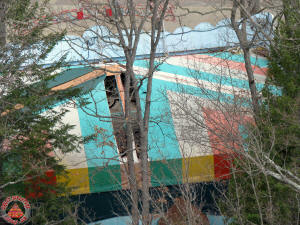 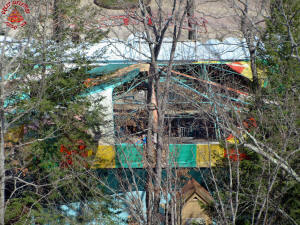 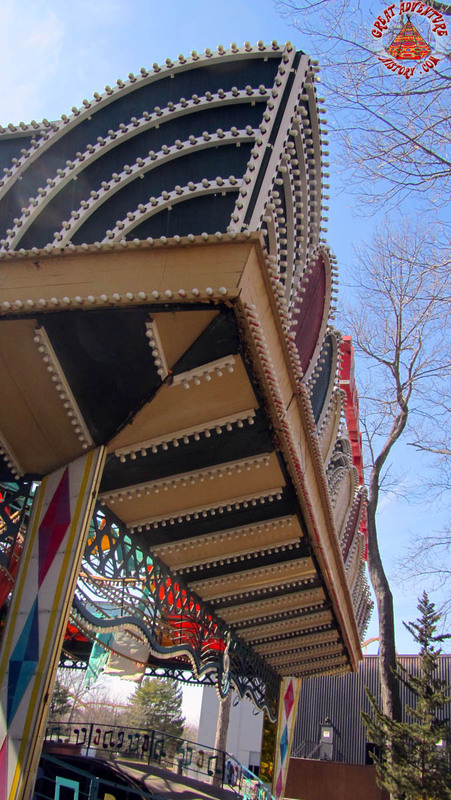 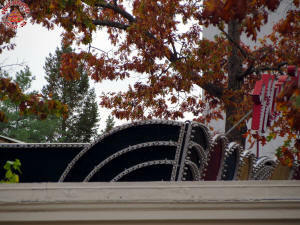 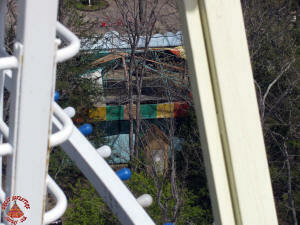 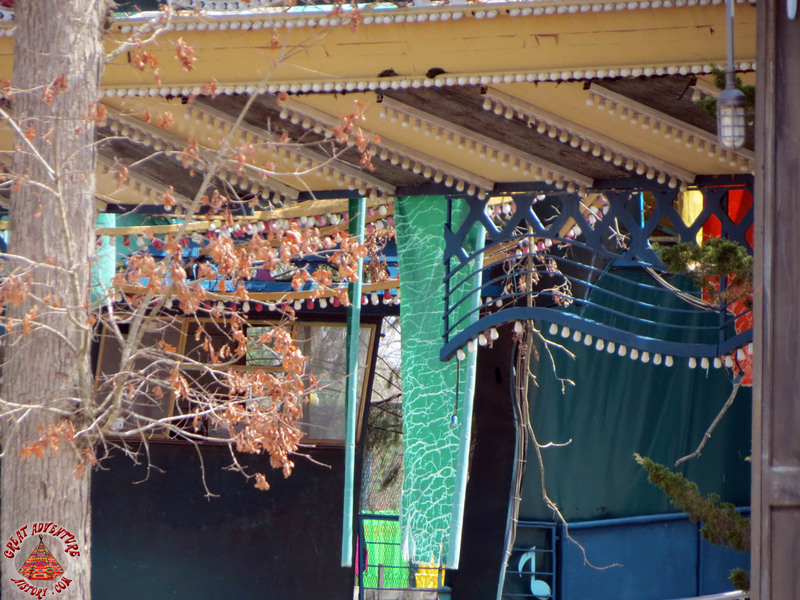 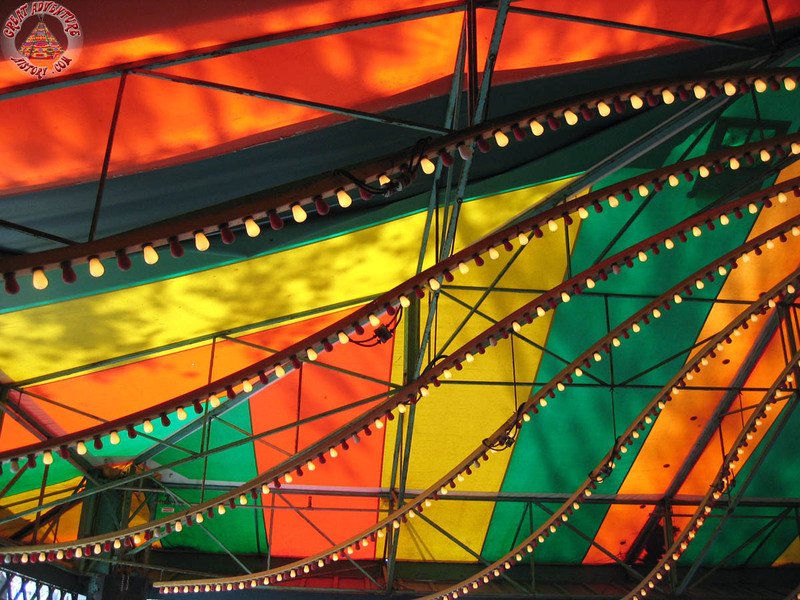 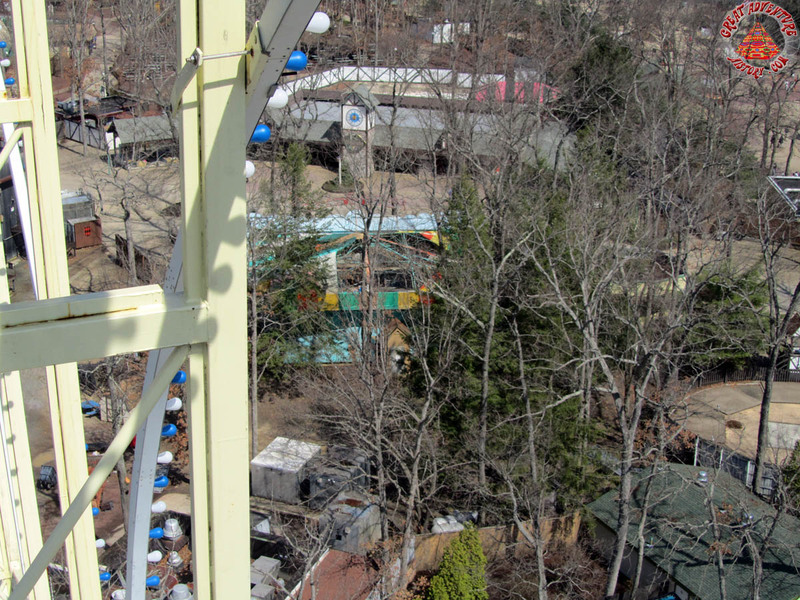 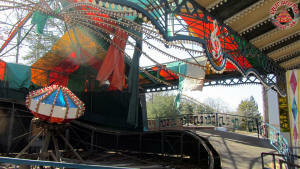 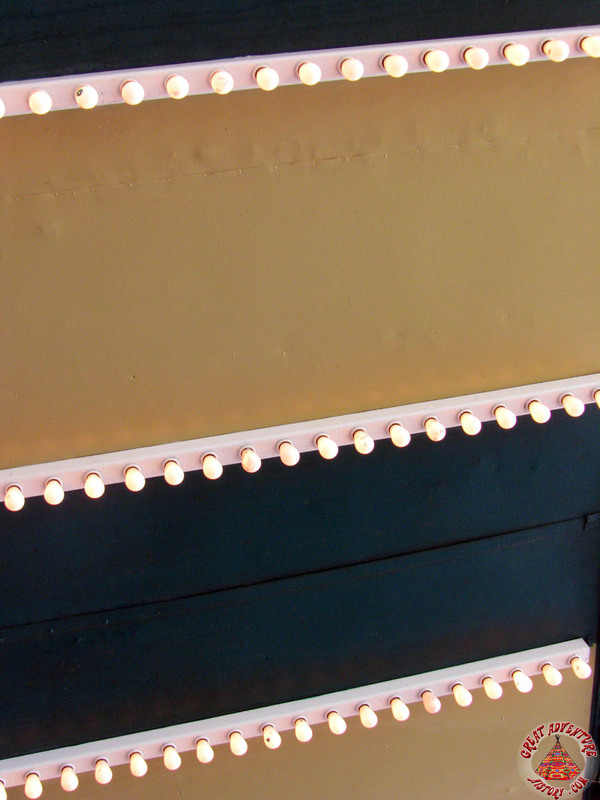 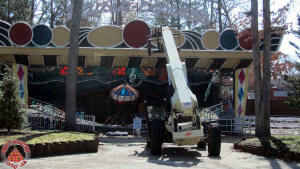 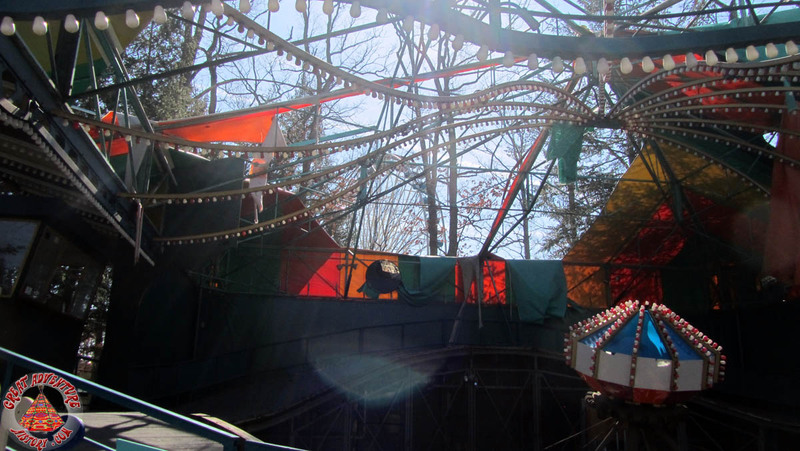 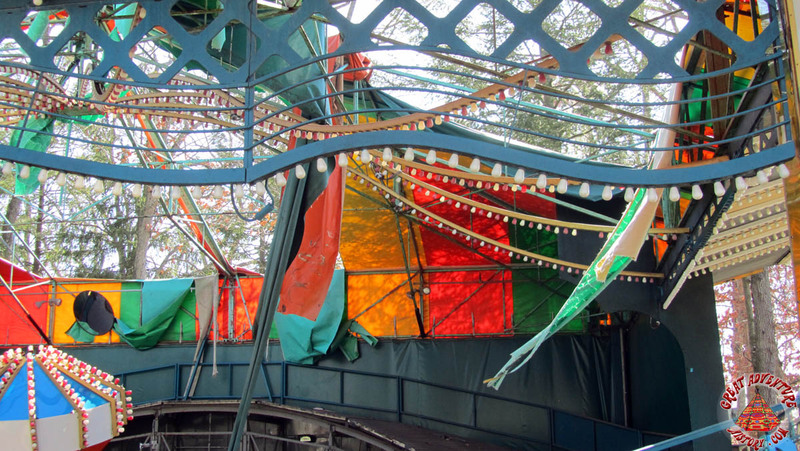 Periodic changes to the ride occurred in the form of new canvas roofing and new wall panels. The floral designs on the central hub would eventually be removed when its Plexiglas panels were replaced in a rehab occurring in the early 1990's. 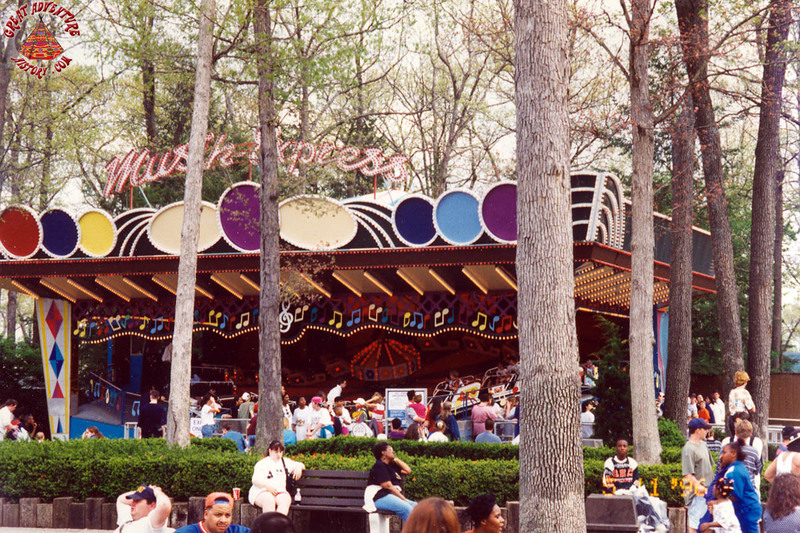 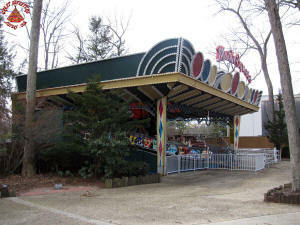 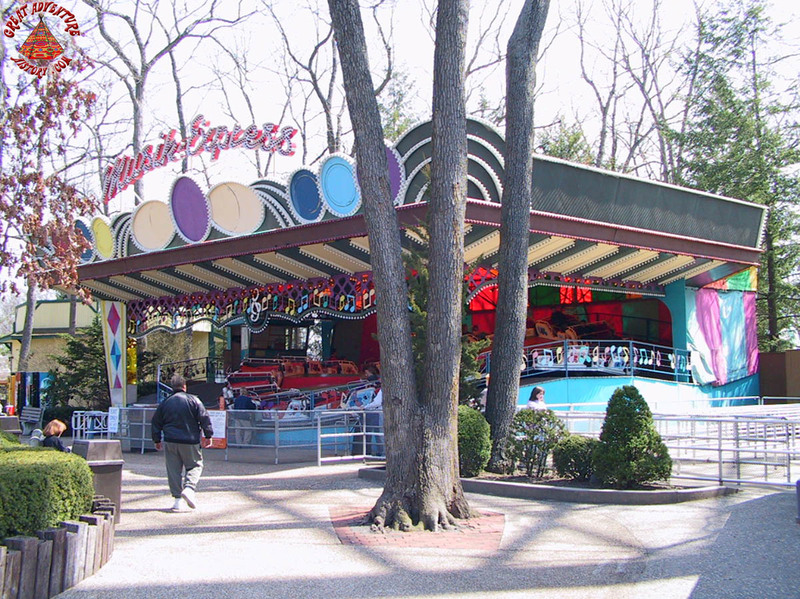 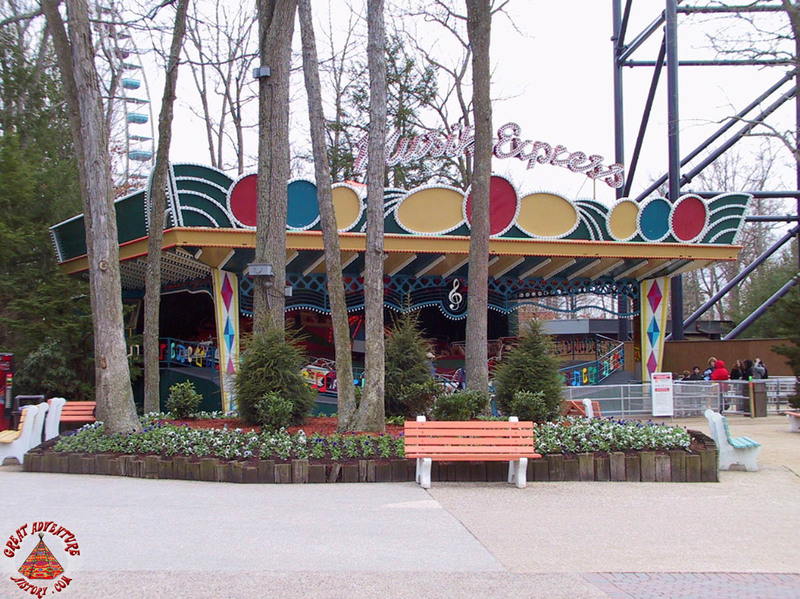 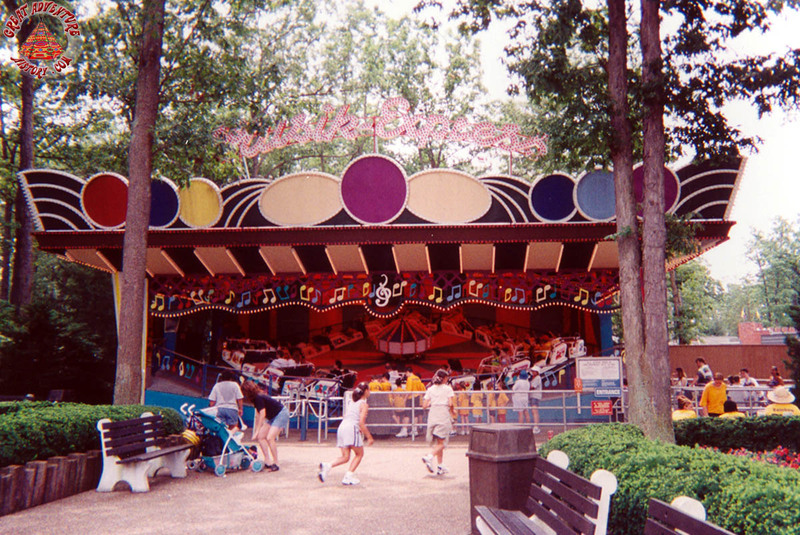 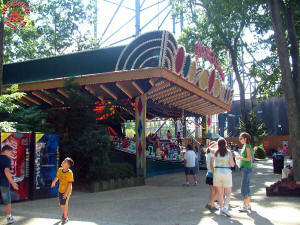 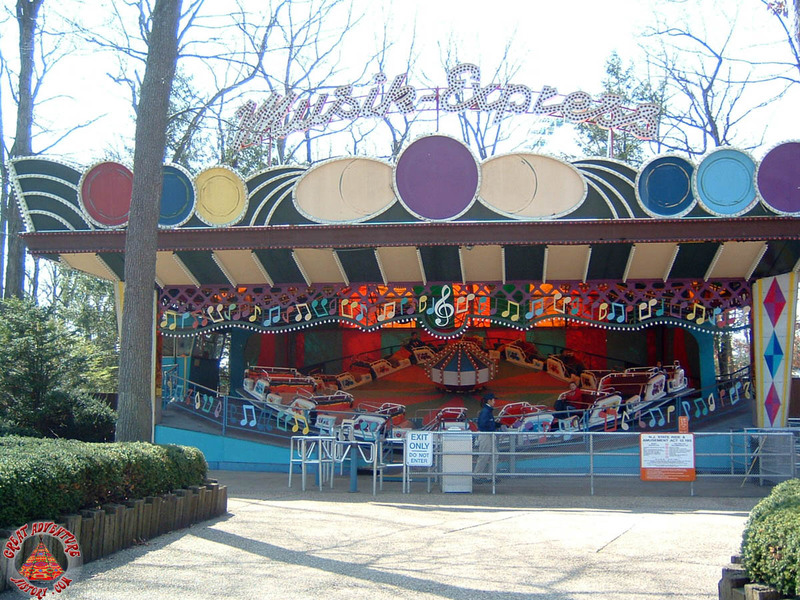 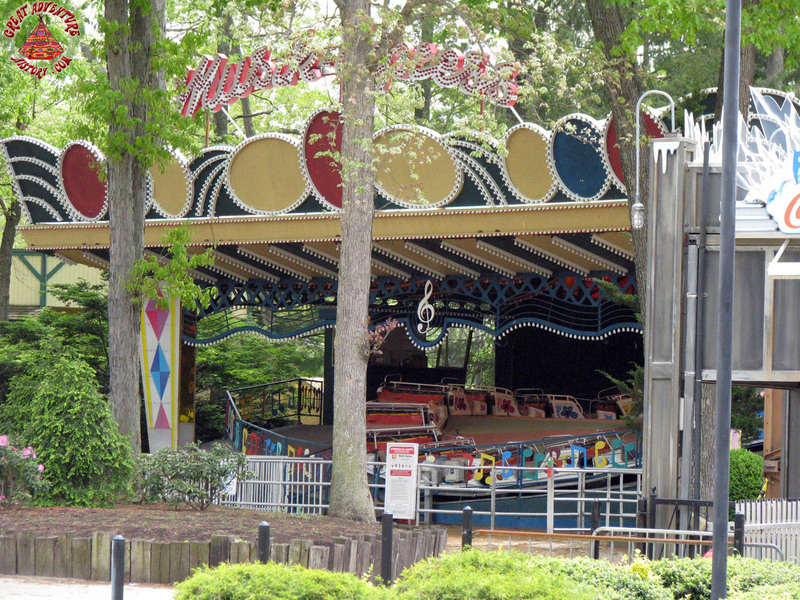 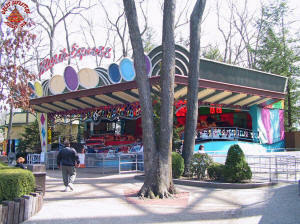 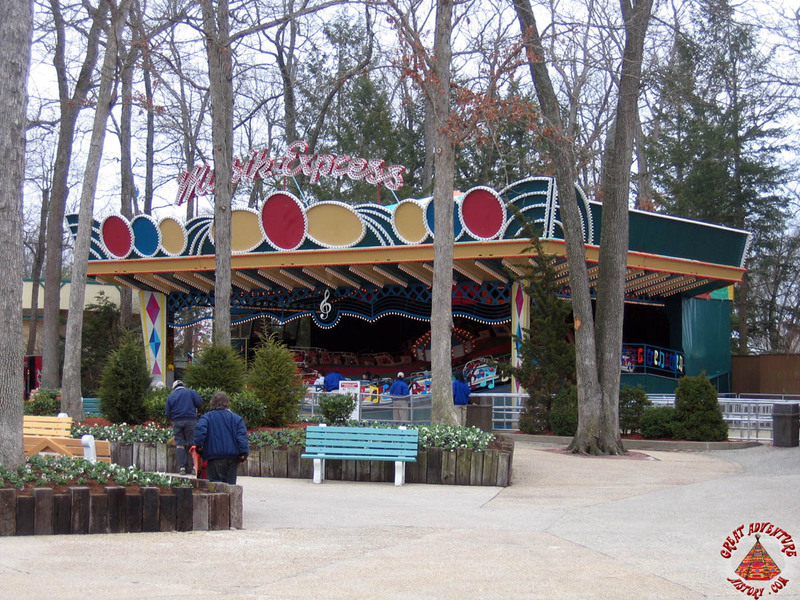 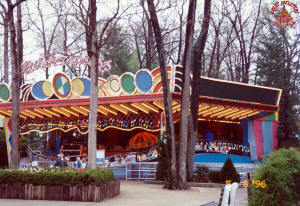 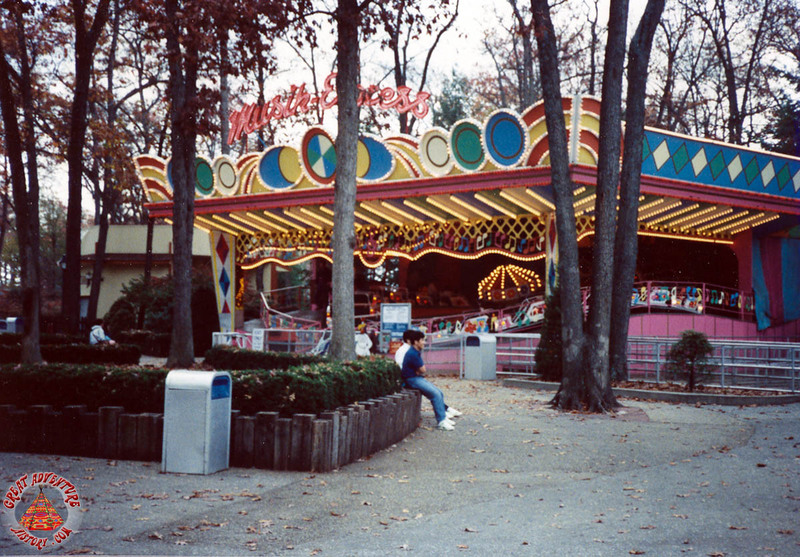 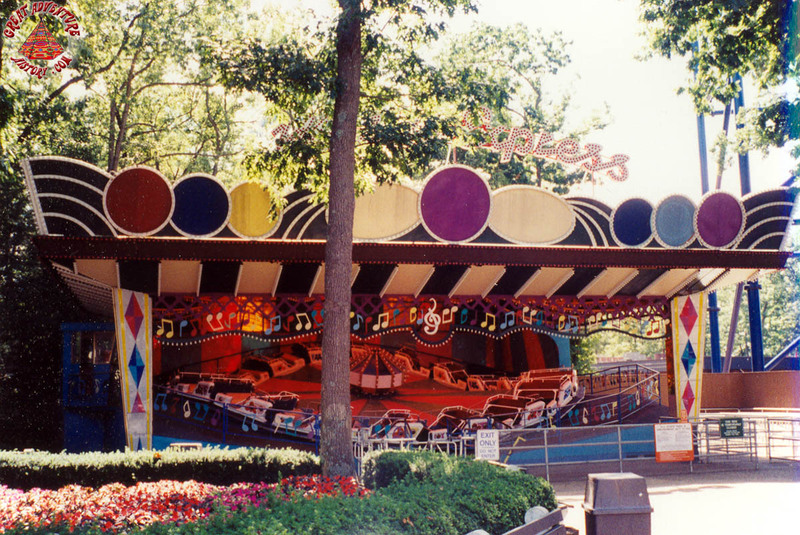 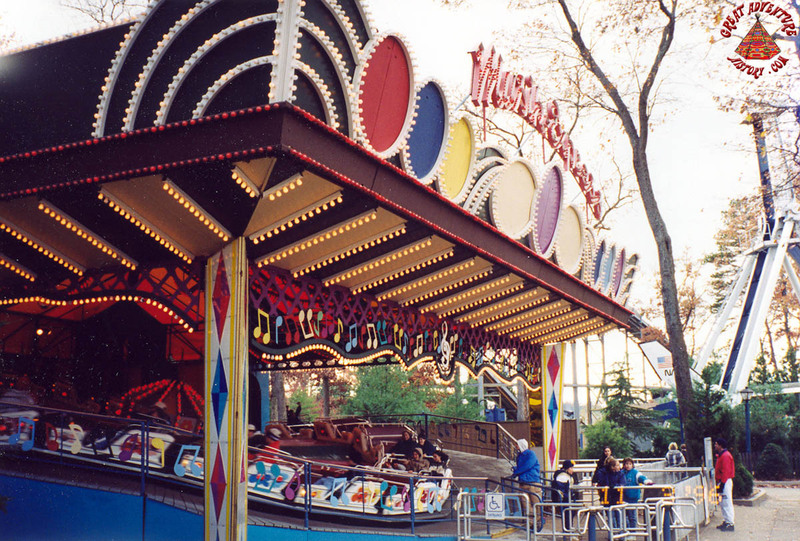 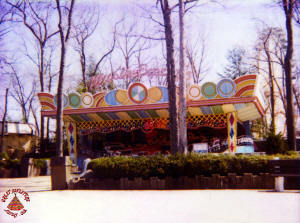 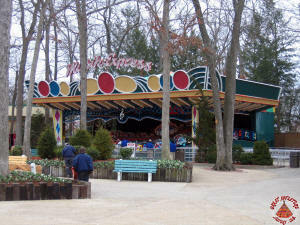 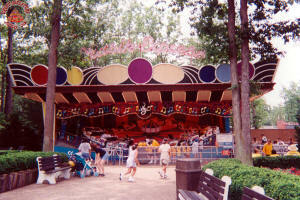 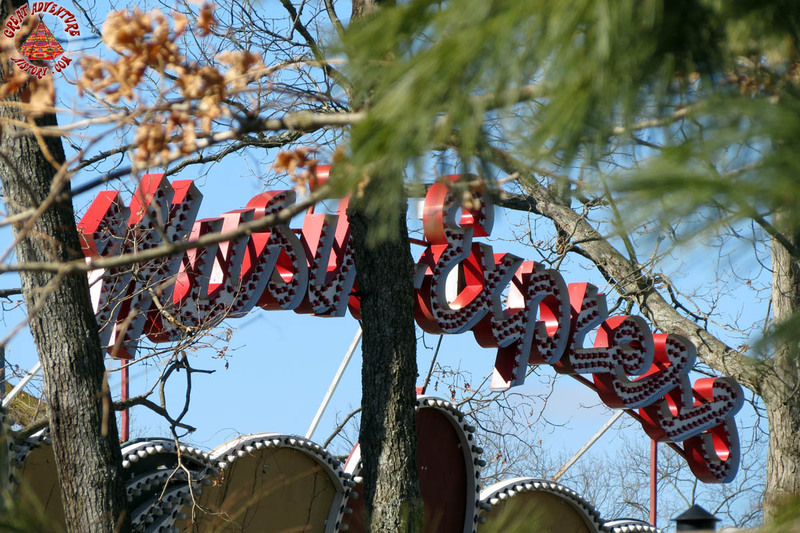 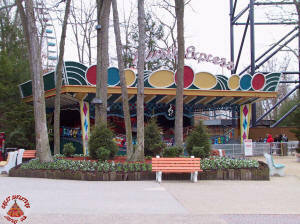 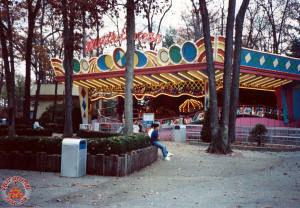 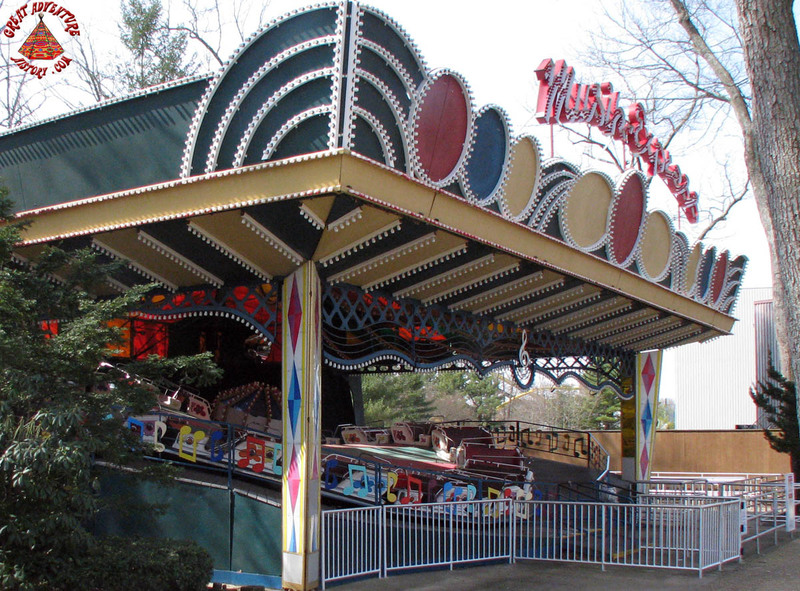 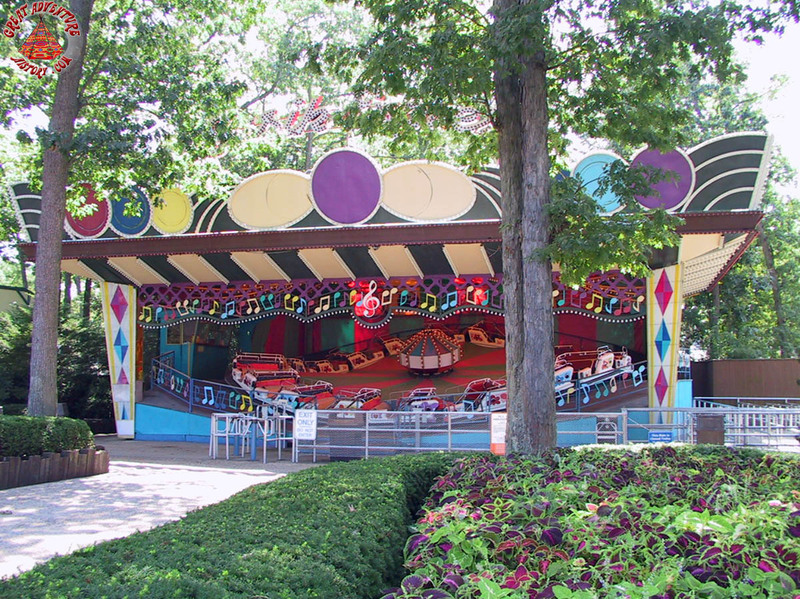 When Time Warner acquired the Six Flags chain, the Musik Express was added to the newly created Old Country area. 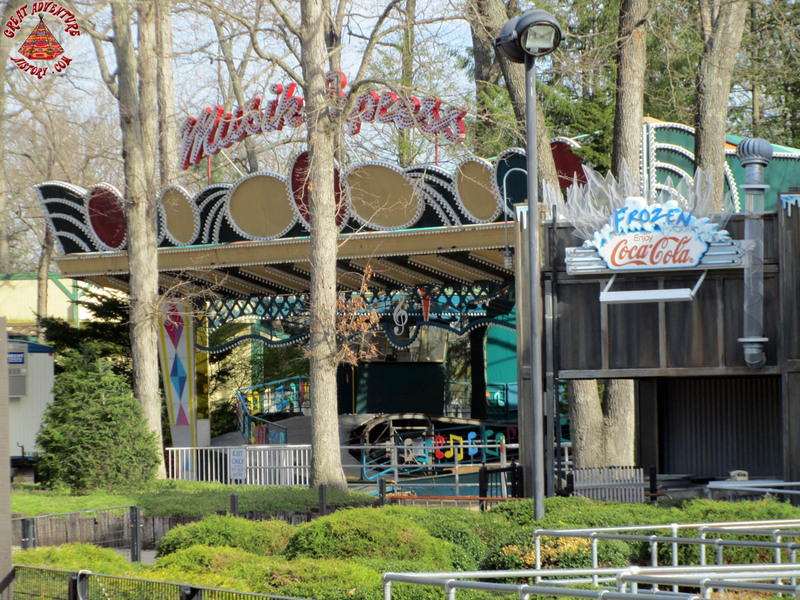 This new theme brought life to a relatively undefined section of the park with the new Autobahn bumper cars and games complex added across the path from the ride. 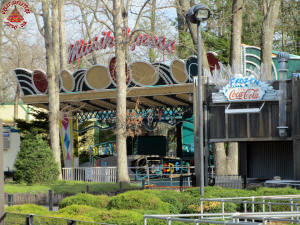 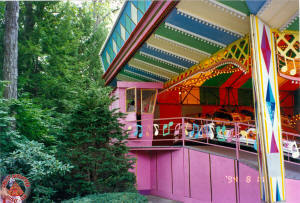 With the update, the Musik Express' flashy colored patterns on the front facade were repainted to warmer, solid colors. 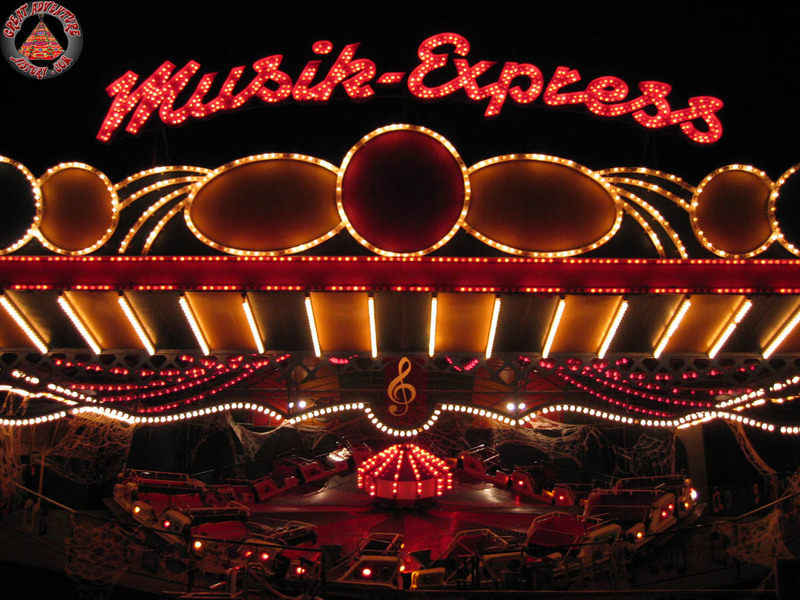 One of the Musik Express' key features was its elaborate lighting package that flashed at night to the rhythm of the music it played. 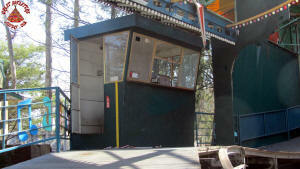 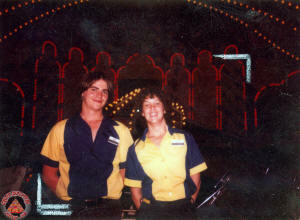 Starting in 2003, the Operator's Booth was no longer used to reduce staffing requirements. 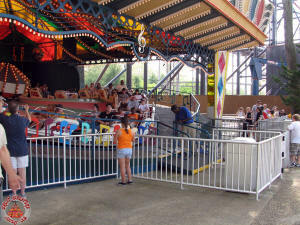 Sole operation of the ride was transferred to one employee who controlled the ride from a panel near the entrance of the ride. 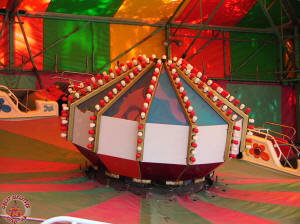 Much of the ride's soundtrack came from the popular hits of the year in which it was operating. 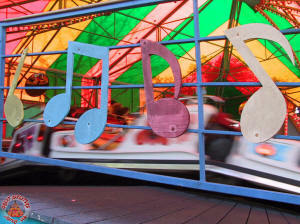 Song selections would differ from shift-to-shift as the various employees would come to work with their own selections of music on their personal cassette tapes. 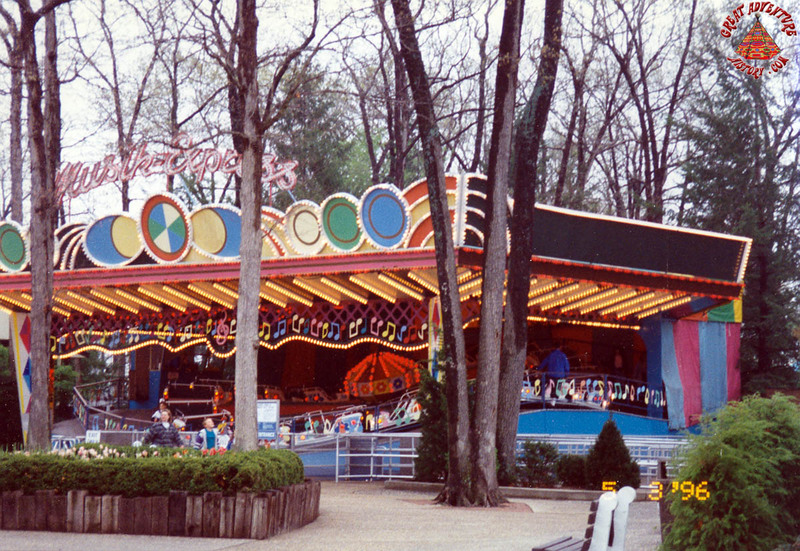 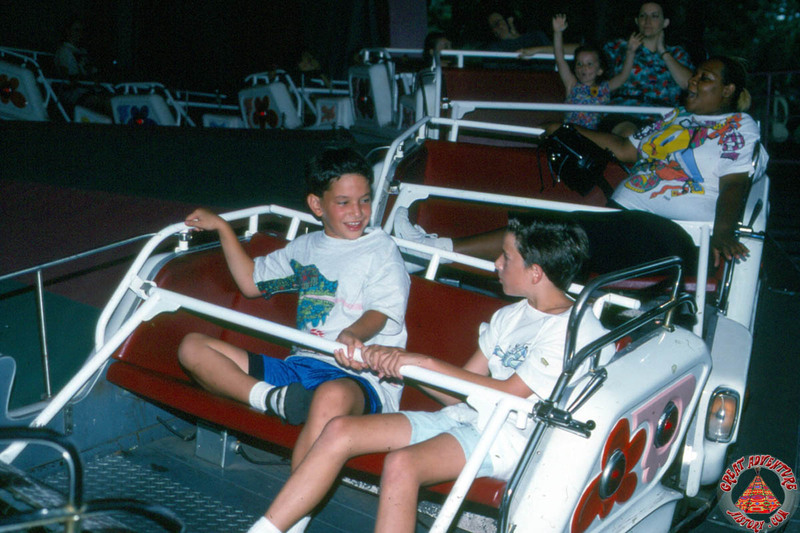 On occasion (particularly when park management would pass by and hear an inappropriate song choice), the operating crews would be order to play only park-provided cassette tapes. 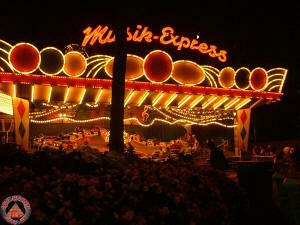 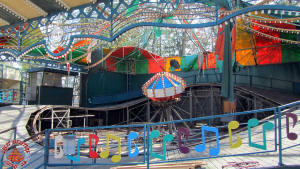 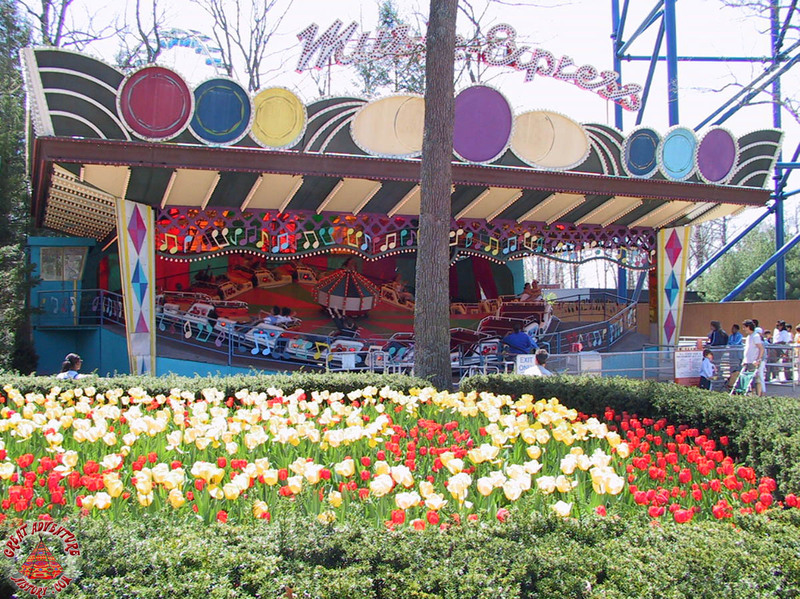 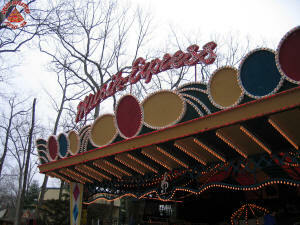 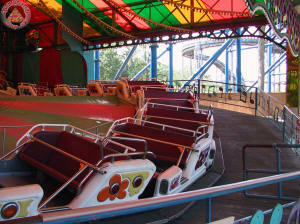 Along with the Autobahn, the Musik Express received a complete rehab over the 2006-2007 offseason. Musik Express' rehab required ride reassembly which reopened shortly after delays caused by the installation of a new canvas roof and mechanical touch-ups to the ride. 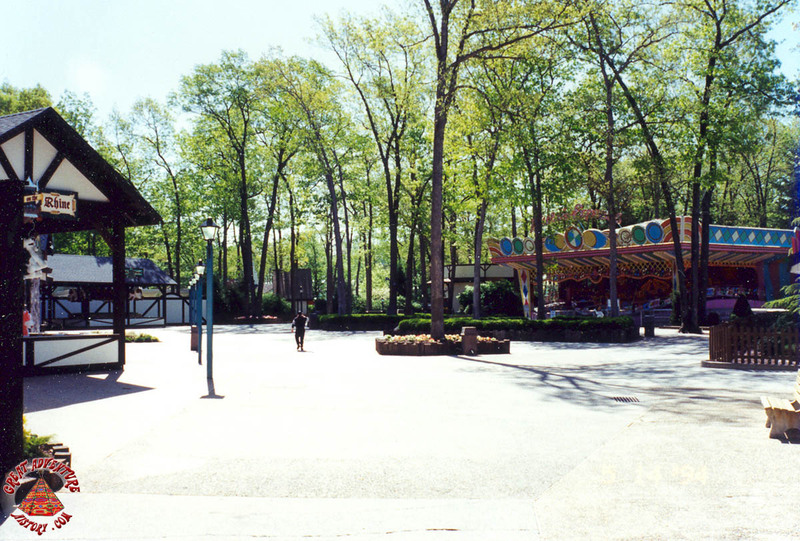 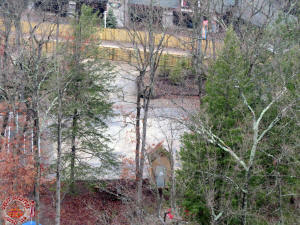 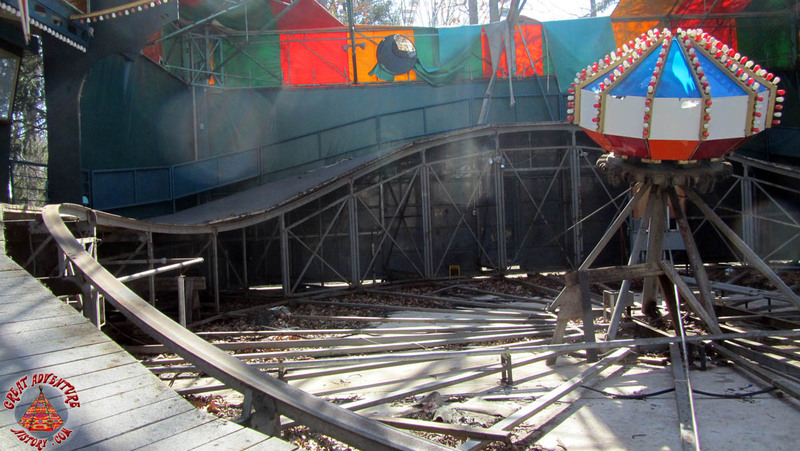 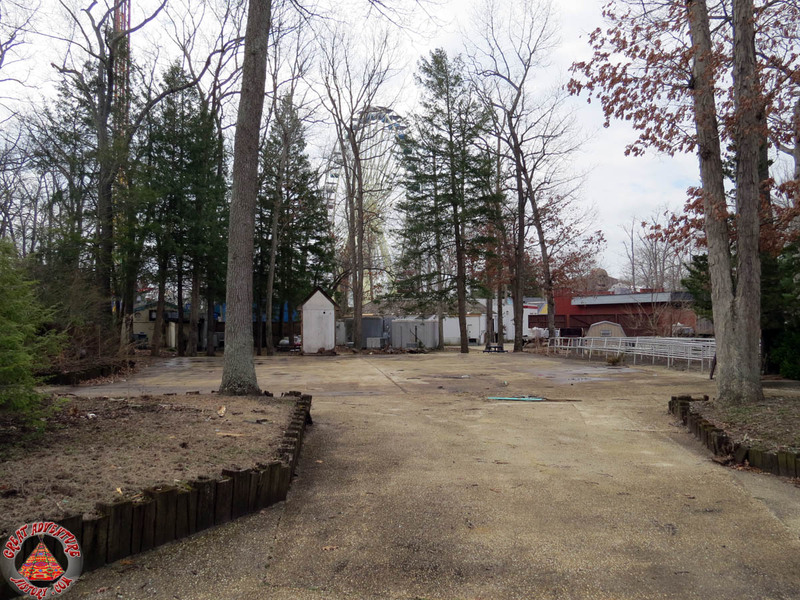 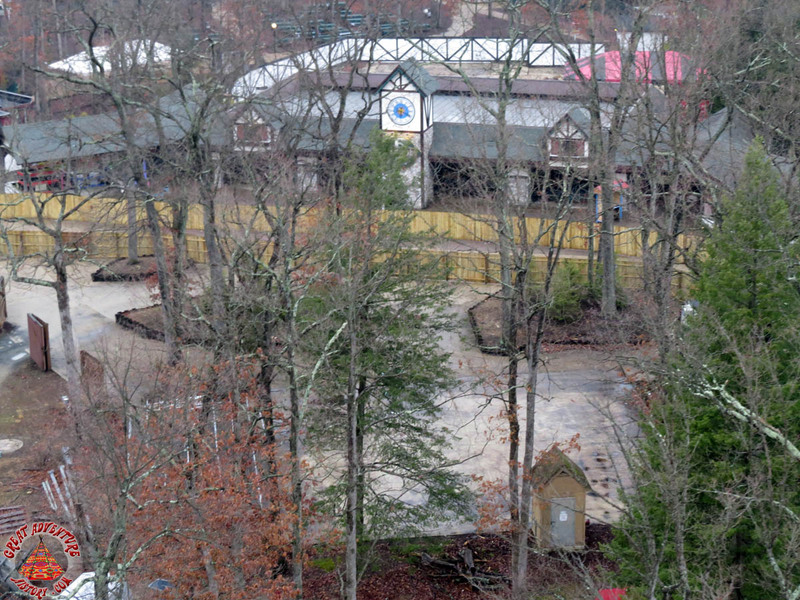 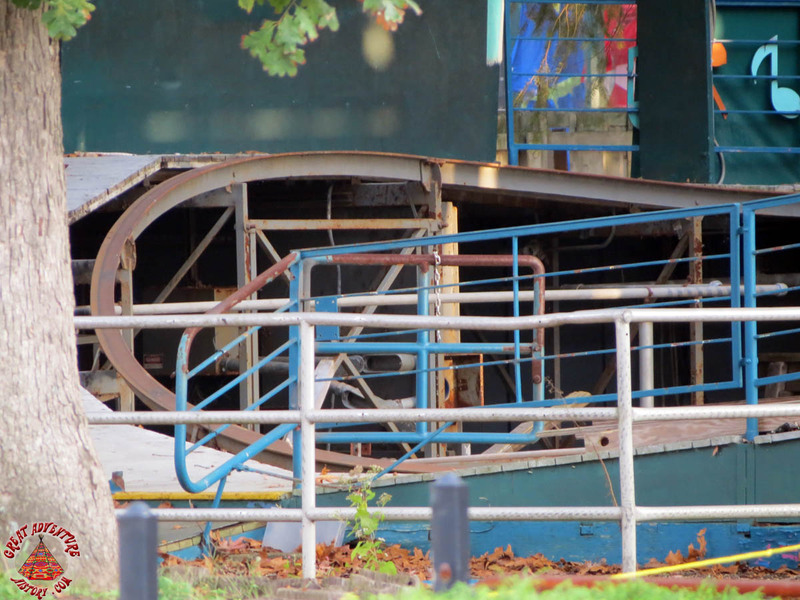 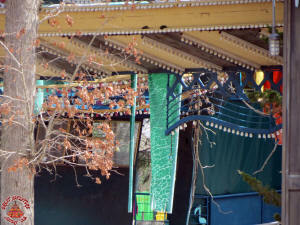 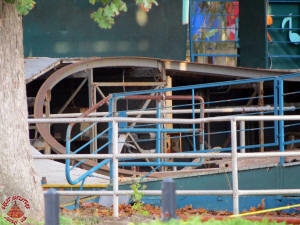 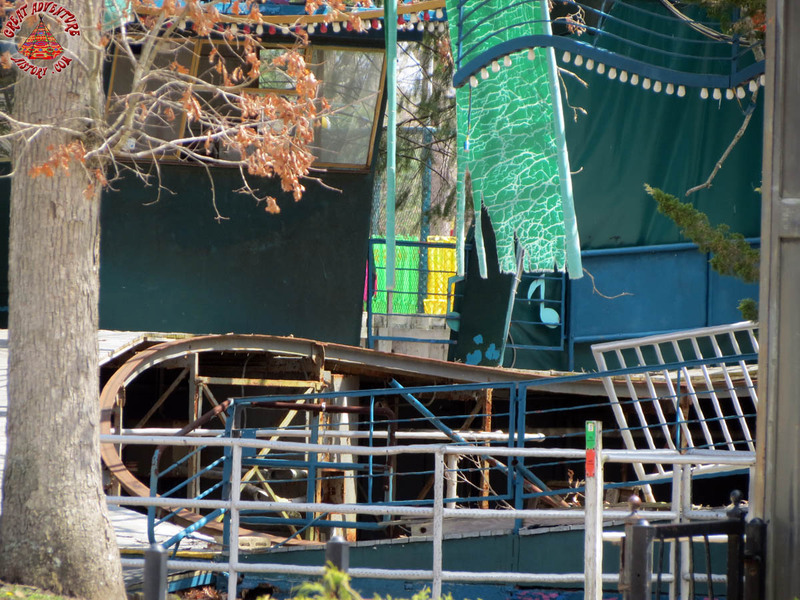 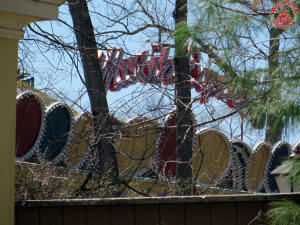 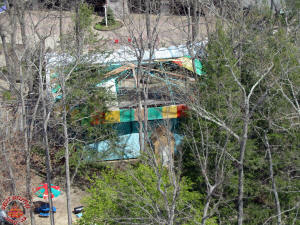 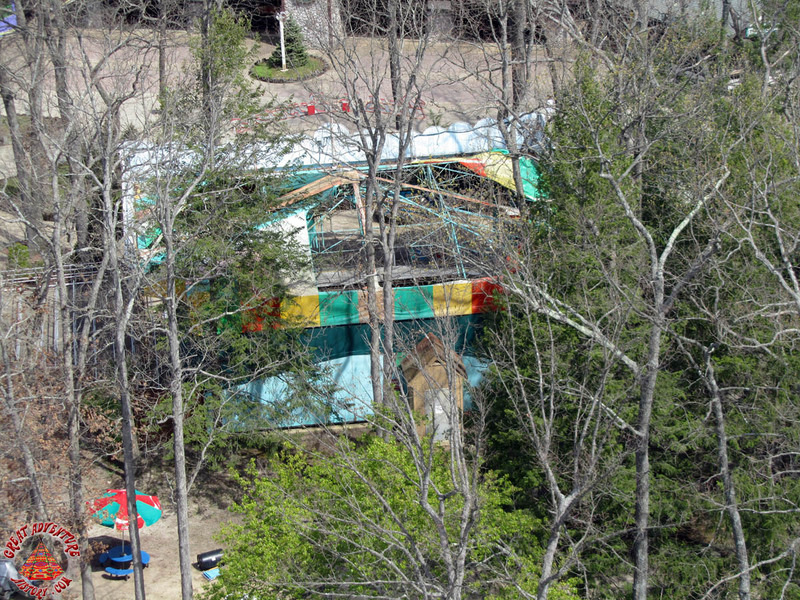 Guests who ventured to the Showcase Theater or catering area could see the former attraction beyond the trees and fences. 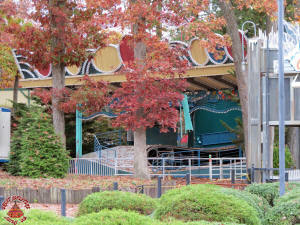 They saw the former queue line began to rust and trees slowly overtake the once vibrant structure. 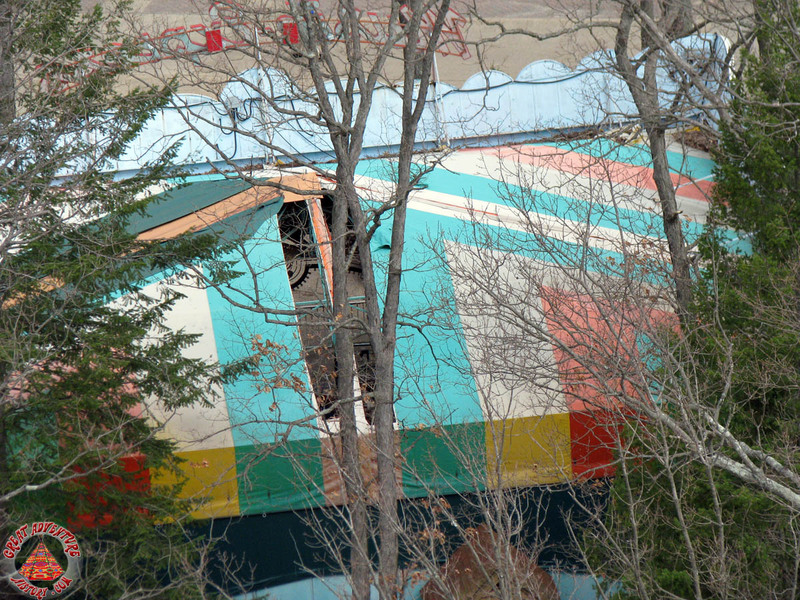 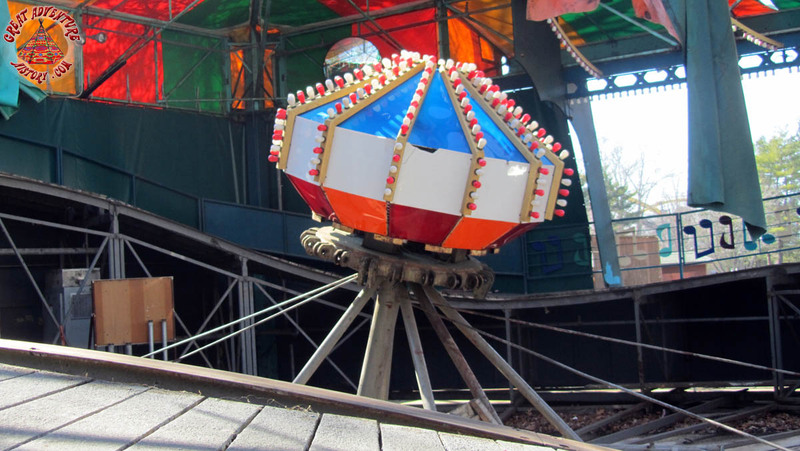 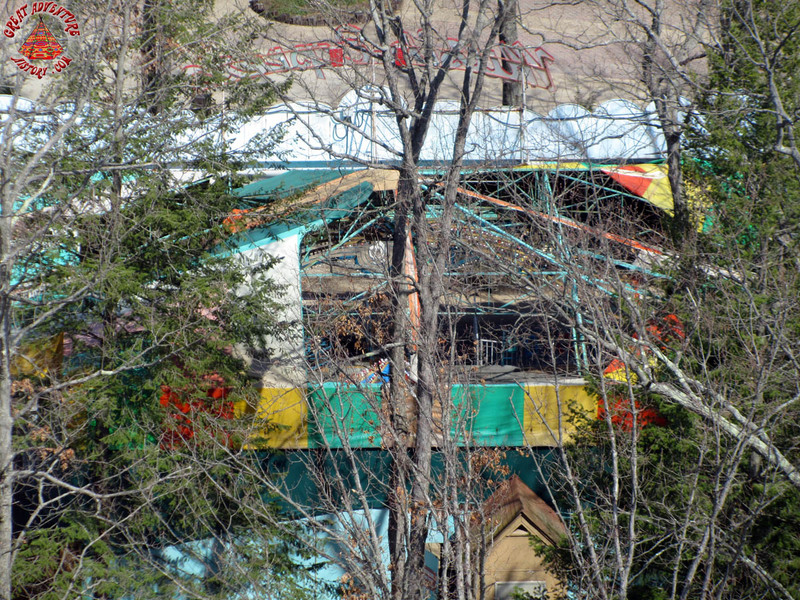 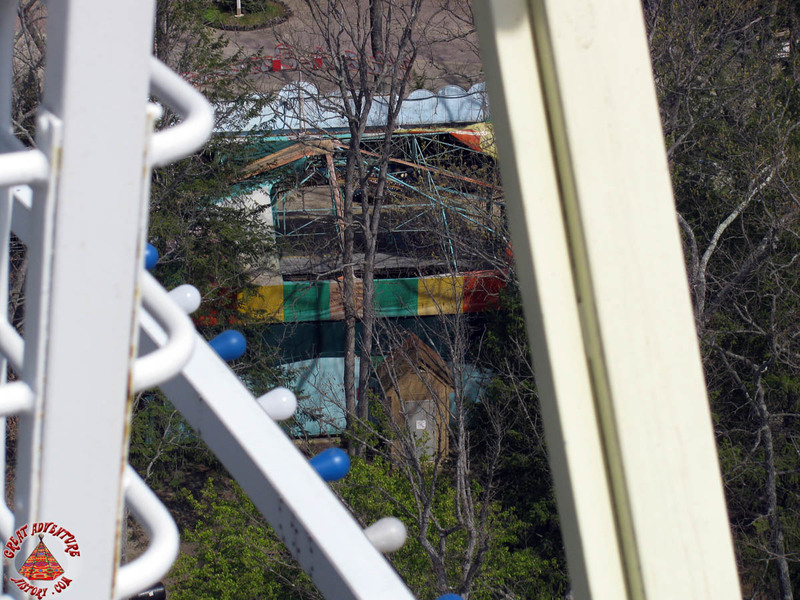 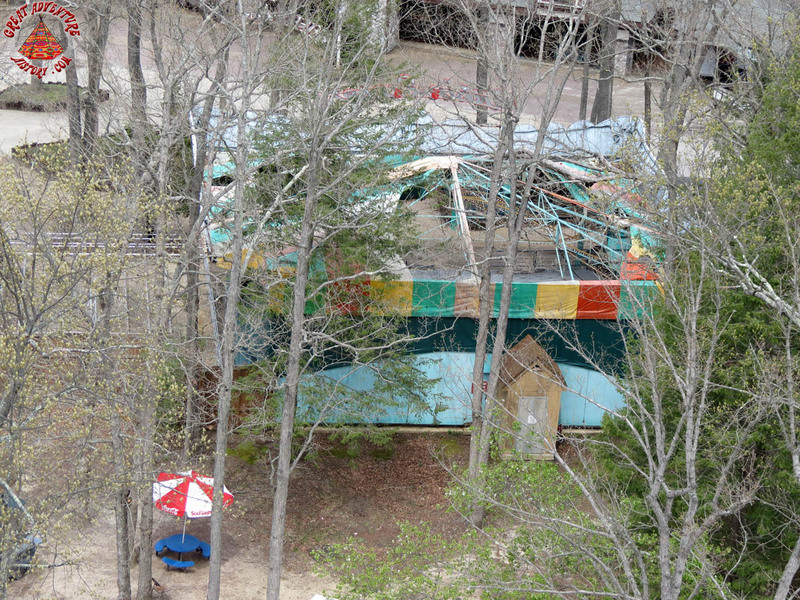 The strong winds of winter took its toll on the canvas roof of the ride which could be observed from atop the Big Wheel blowing in the breeze. 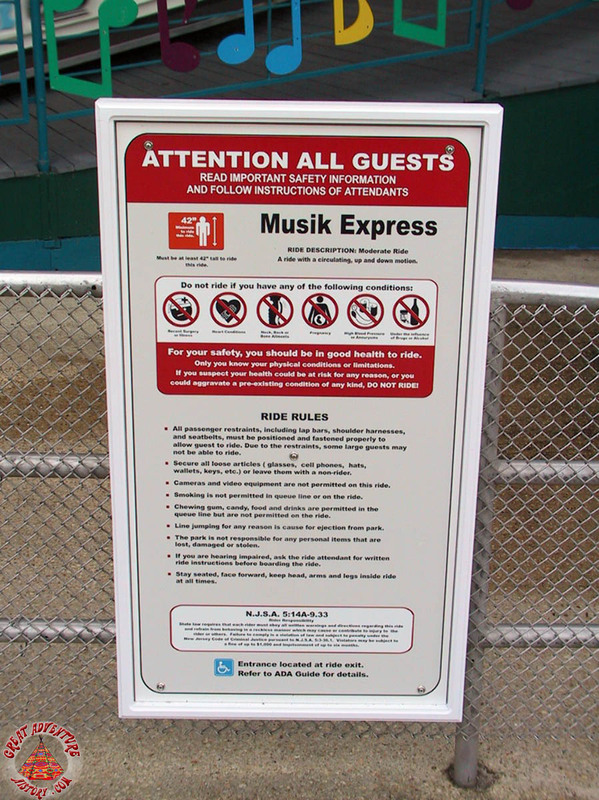 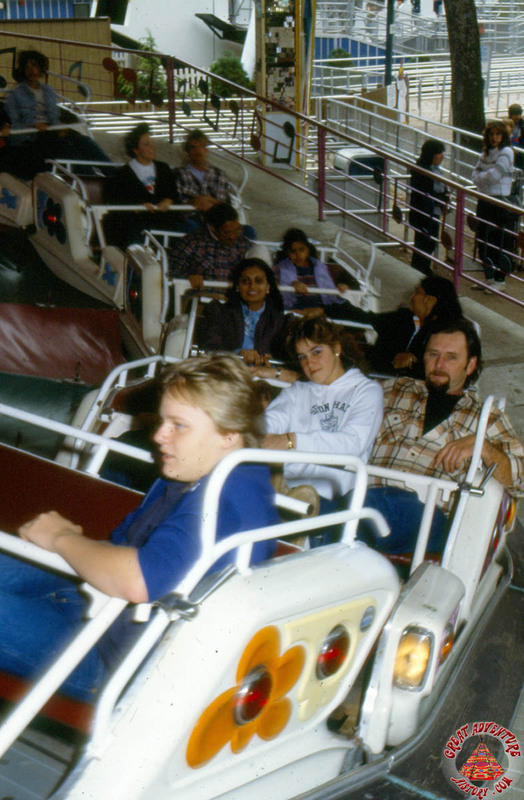 In the time that it was left standing, the Musik Express' cars were sent to Six Flags Magic Mountain to replace the cars of their identical ride model. 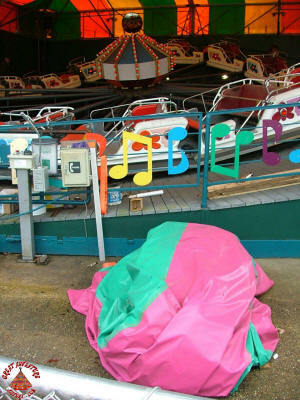 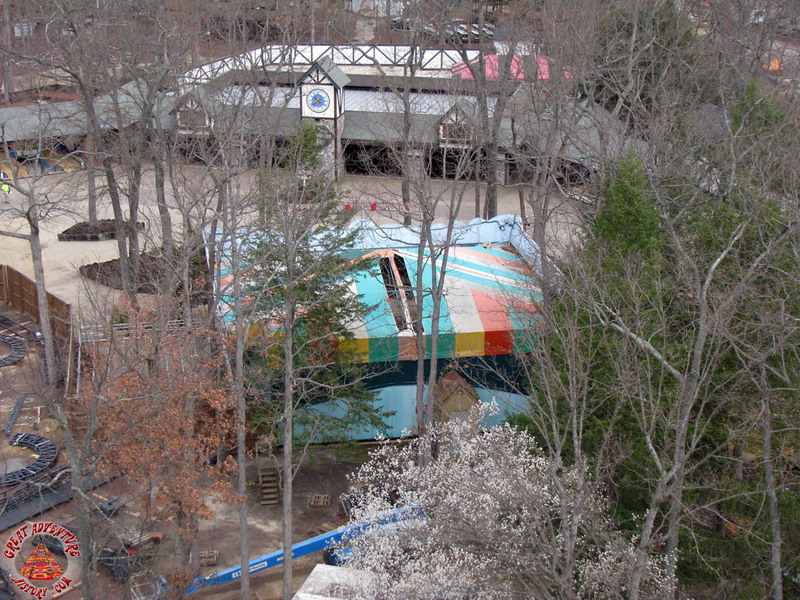 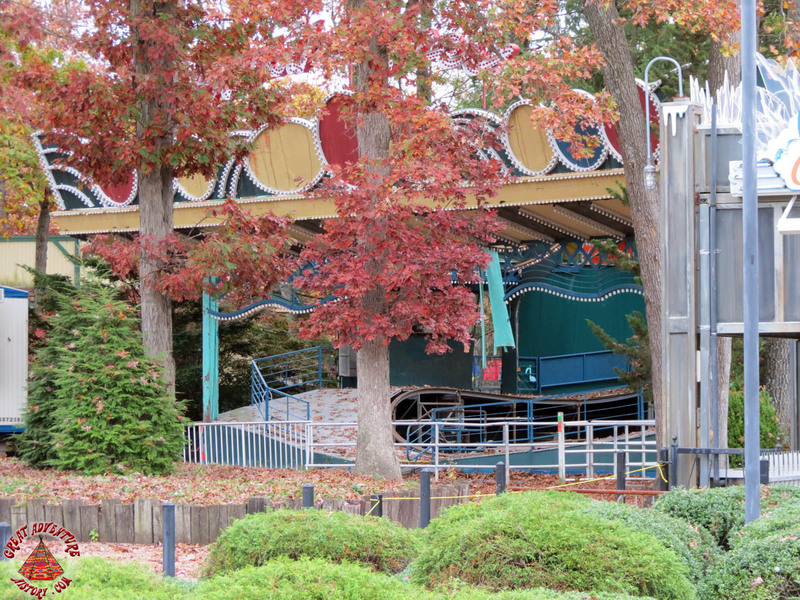 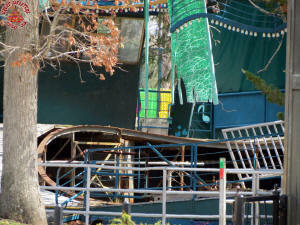 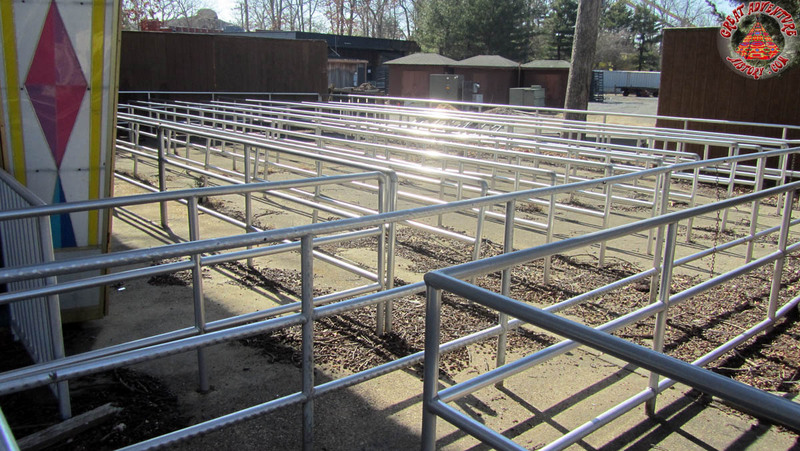 The model at Great Adventure was left as a literal shell of its former self. 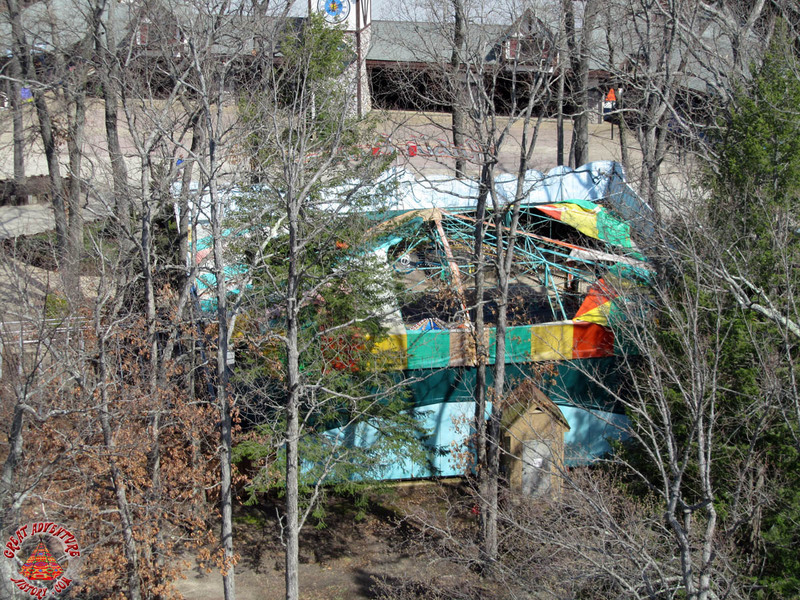 In 2014, it was decided to permanently remove the structure. With the building's removal ended speculation that the Musik Express and perhaps Autobahn would ever return. 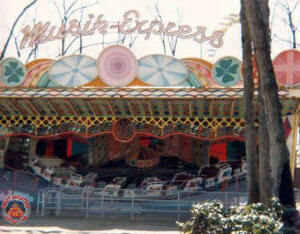 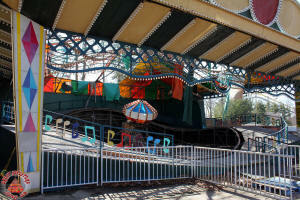 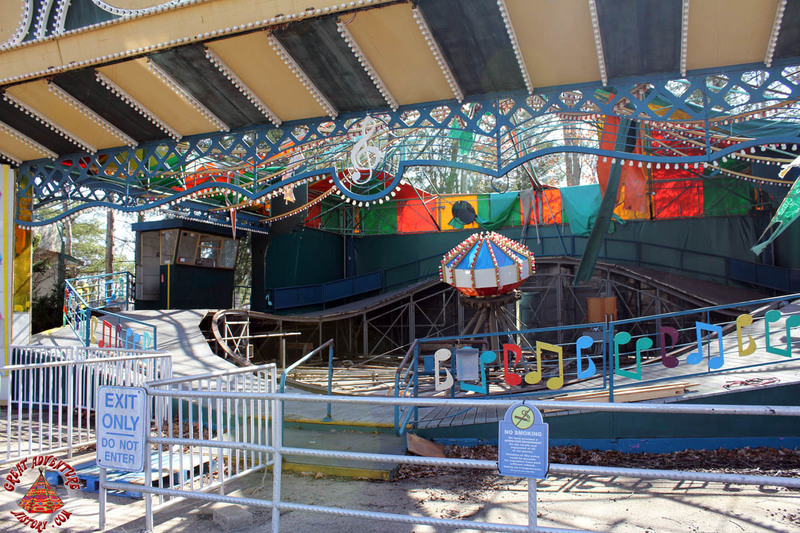 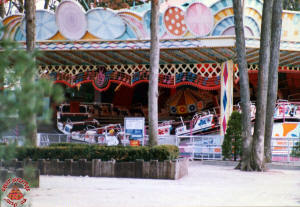 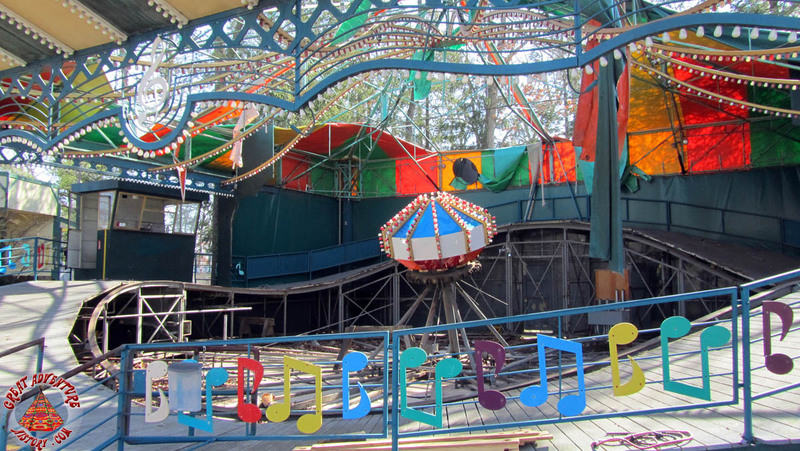 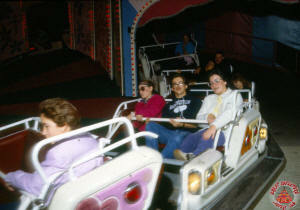 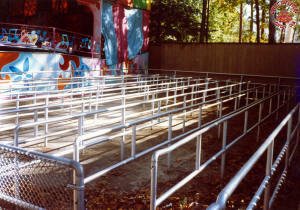 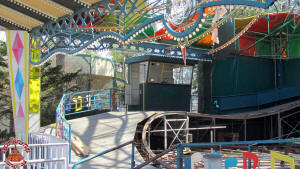 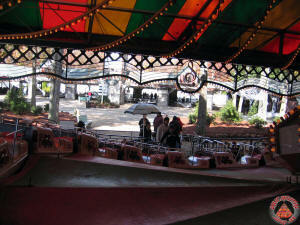 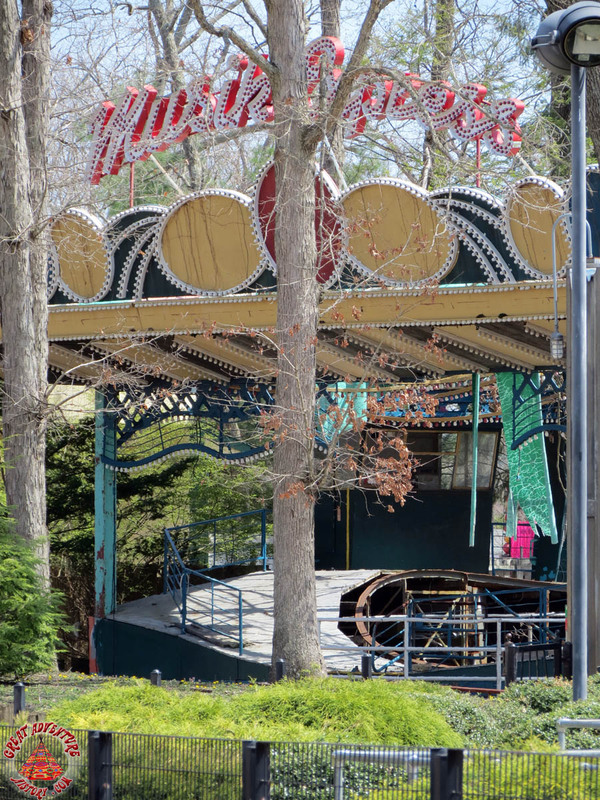 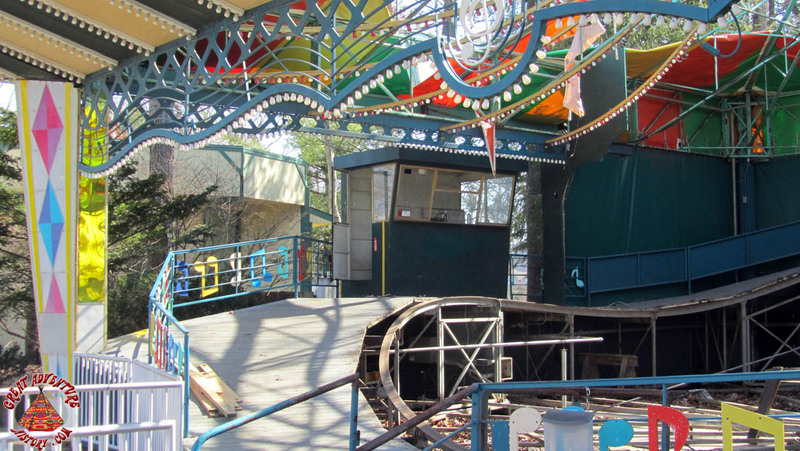 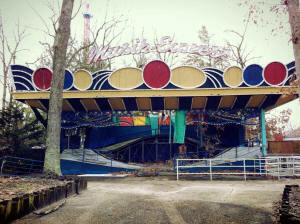 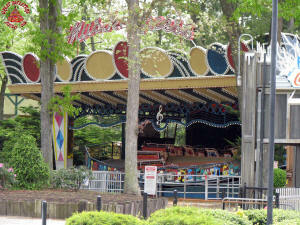 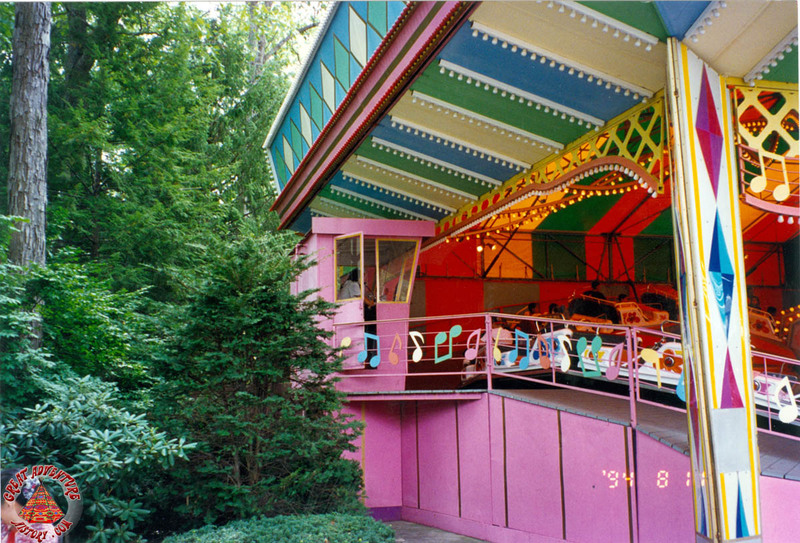 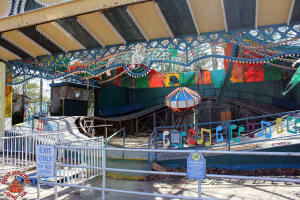 The only current remnant of the Musik Express is the concrete slab on which the ride was built. 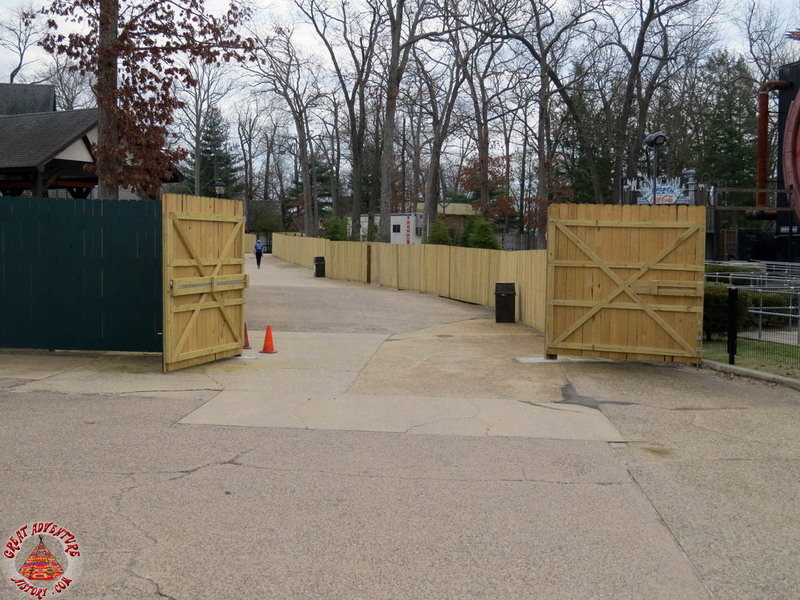 Currently, it is hidden by a fence and now has a small trailer used for entertainment employees as a dressing area. 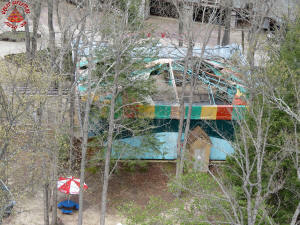 Also on the site are picnic tables and umbrellas to serve as an outdoor break area for park employees. 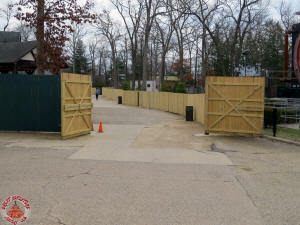 This is visible to guests who walk the reopened path to the Metropolis area near Justice League and Cyborg Cyber Spin. 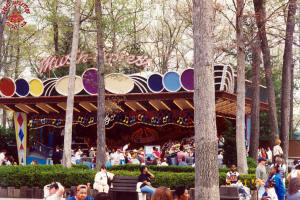 Though long gone, many guests of Great Adventure remember fondly their toe-tapping rides aboard the Musik Express. 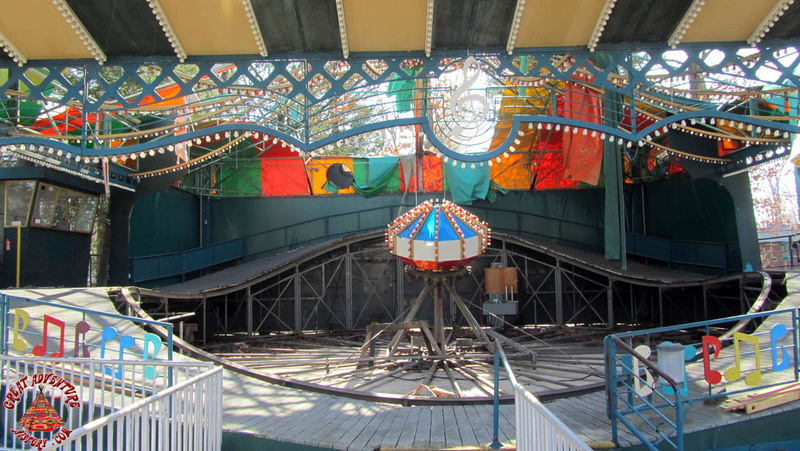 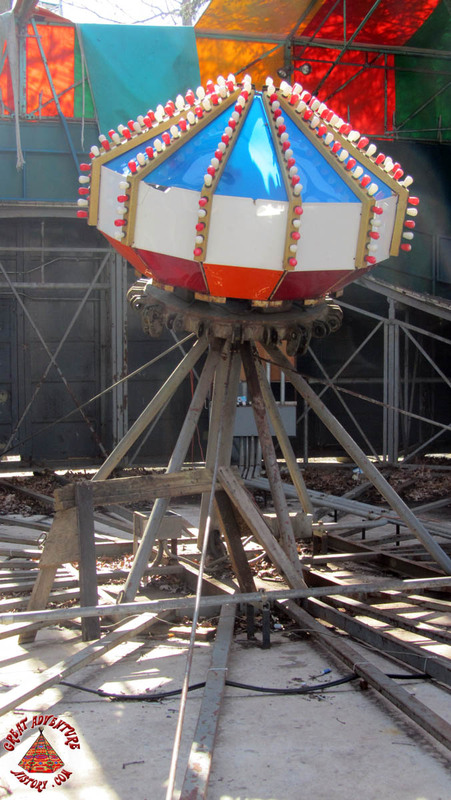 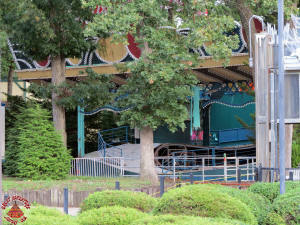 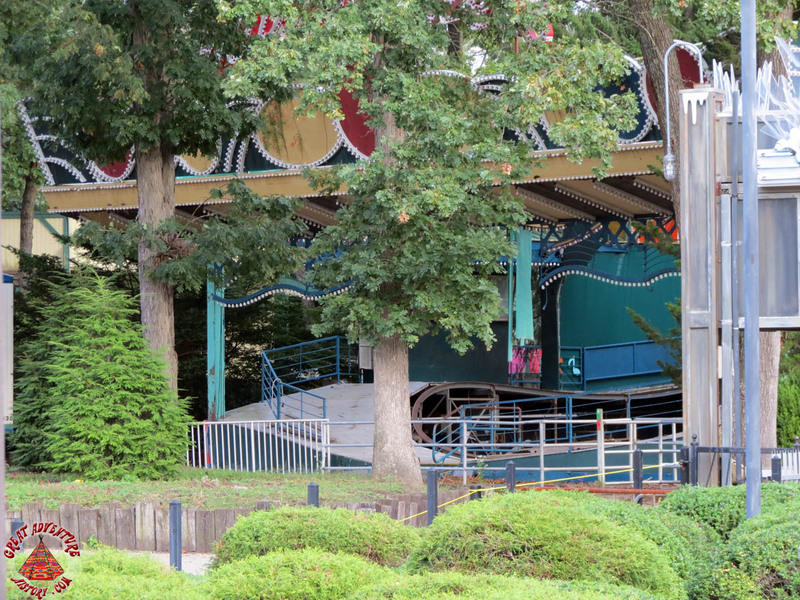 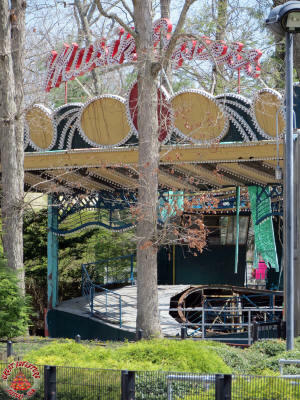 It is hoped that the former site of this ride will be repurposed for future development of the Metropolis section of the park. 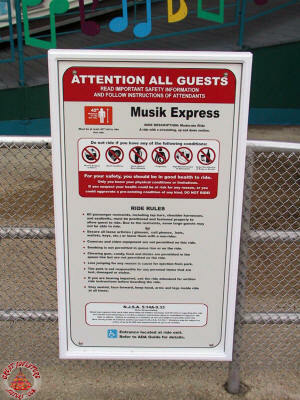 Note: Ground-level photos of the Musik Express during its post-operating years were taken with the permission of the park while in their presence. 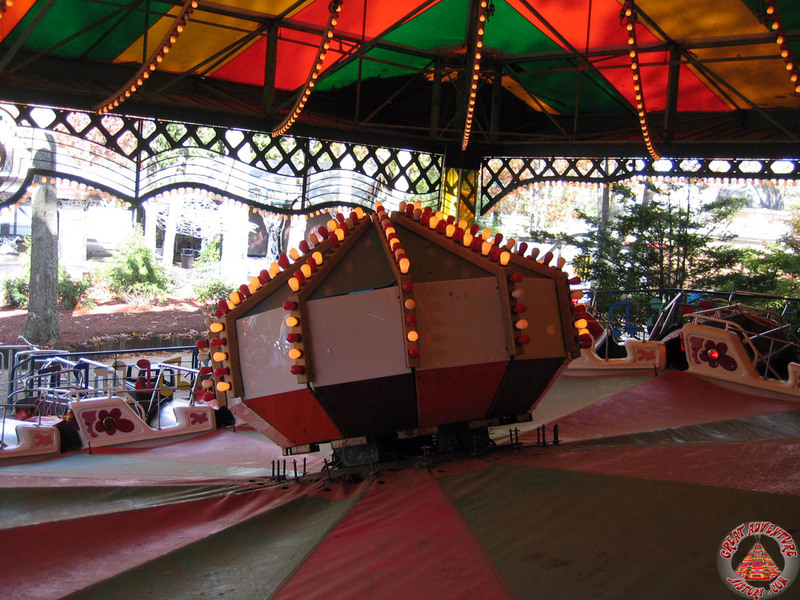 The Jolly Roger offers a ride experience similar to the old Musik Express, less the music and enclosed lighting that added greatly to the overall fun. 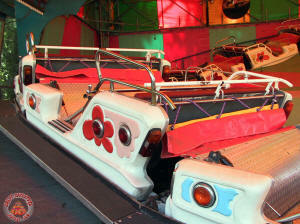 Jolly Roger also does not offer the large oversized padded seats that made the Musik Express a forceful yet comfortable ride. 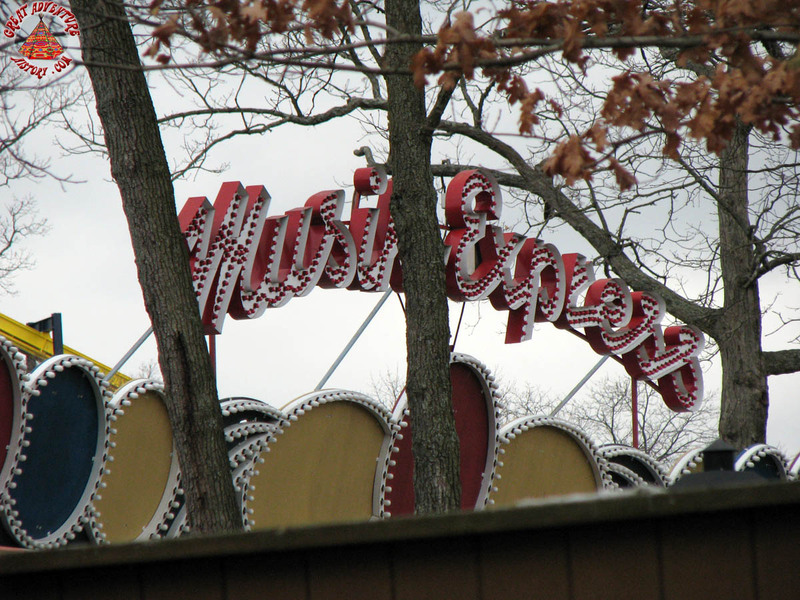 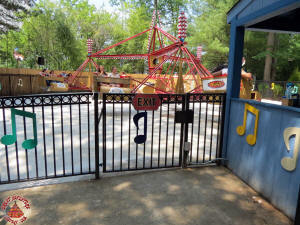 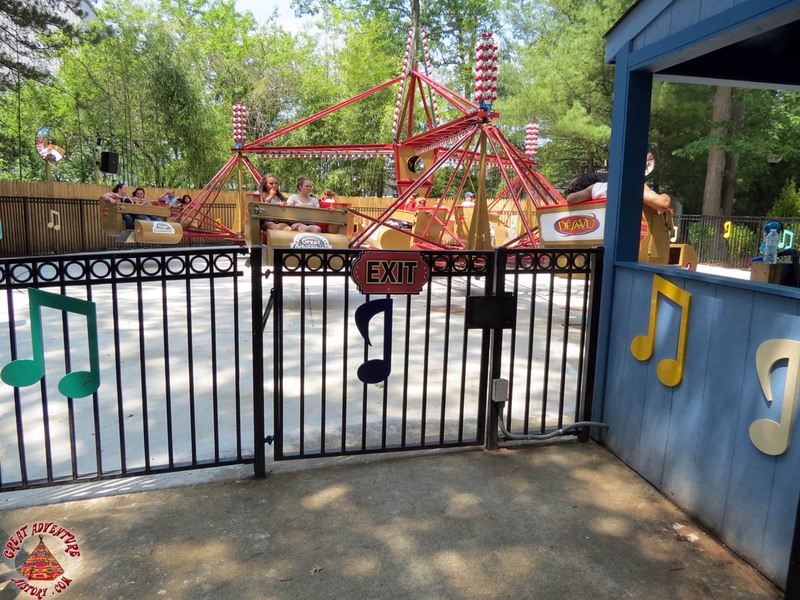 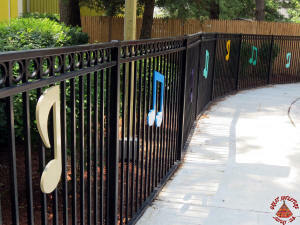 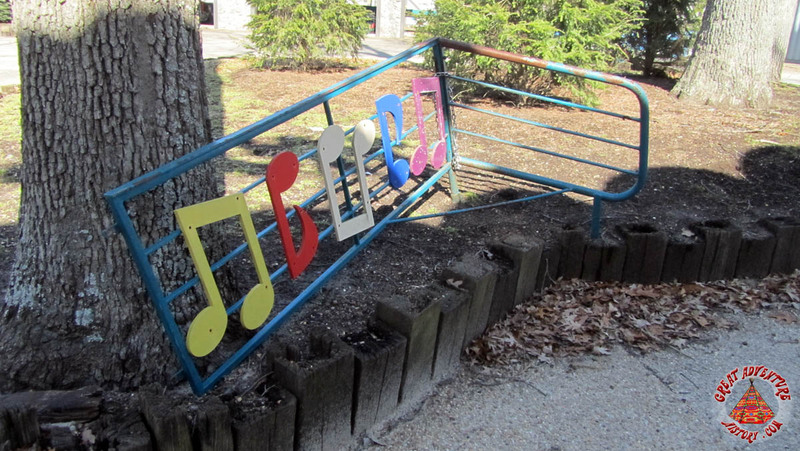 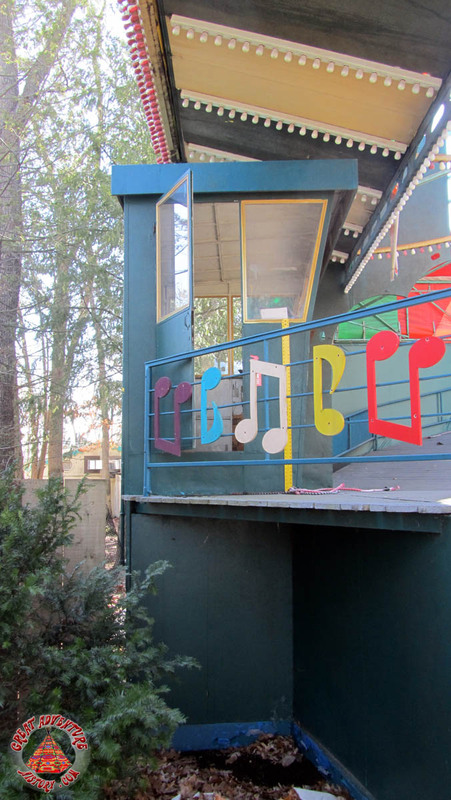 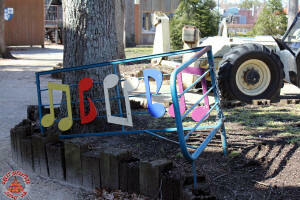 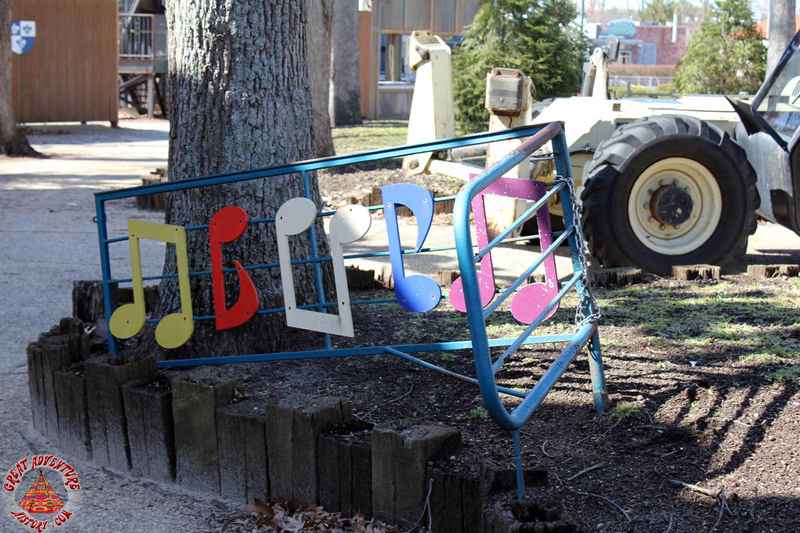 And not too far from the Musik Express ride site, today the Deja Vu scrambler ride is decorated with musical notes reminiscent of those found on the old ride. 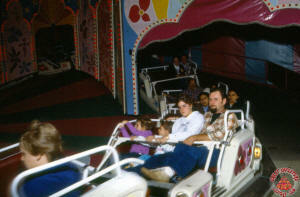 These notes coupled with a predetermined soundtrack which is played during each ride cycle enhances the ride experience. 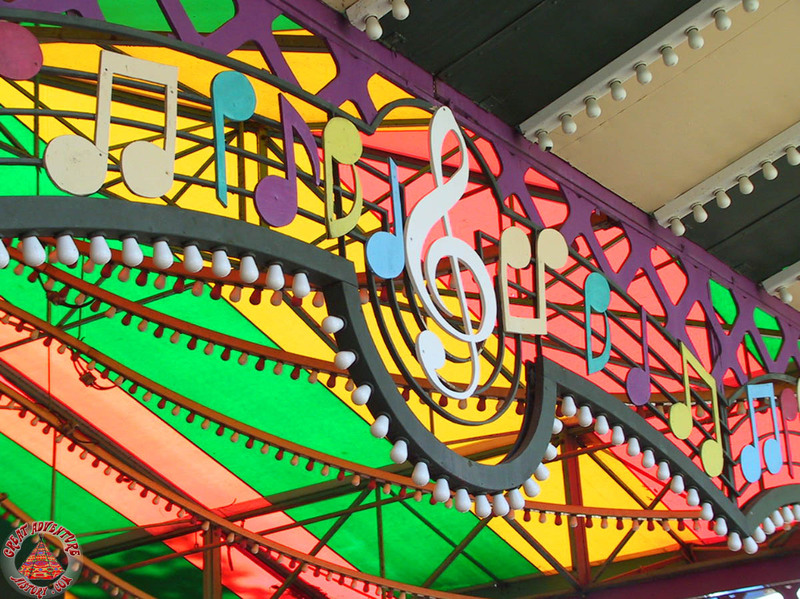 Deja Vu's song lineup is also changed during Fright Fest and Holiday in the Park to carry the theme of those two events.